Kambarbay has excellent conformation and type, beautiful flowing movement, lots of metallic sheen, and his dilute color genetics guarantee gold (buckskin, palomino, cremello, etc. 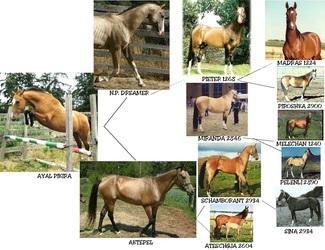 depending on the color of the mare). 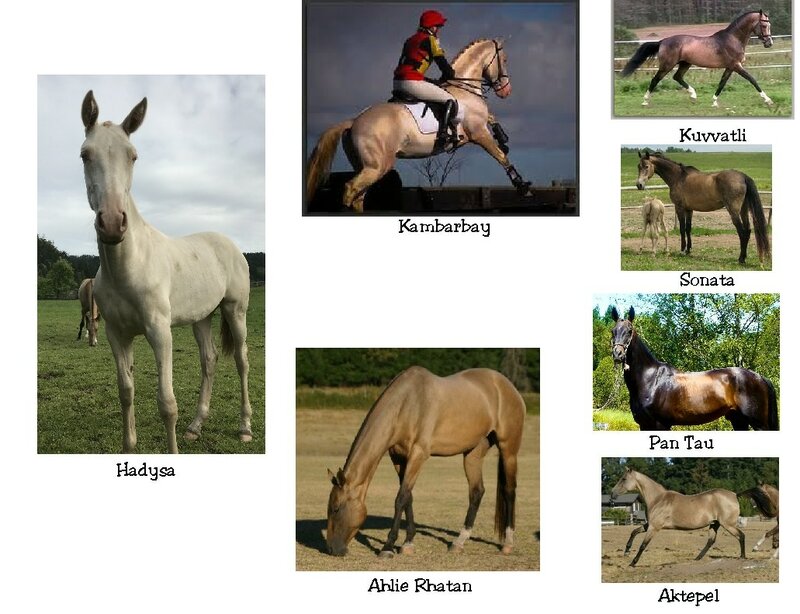 Kambarbay's pedigree is from the Posman line, which is rare in the North America, making him a valuable asset to any Akhal-Teke breeding program, as well as a great addition to colored sport horse breeding programs! 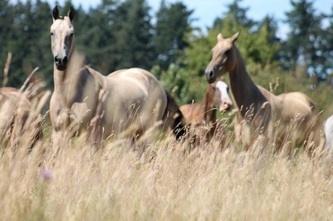 Contact us for additional information, photos, videos, etc. 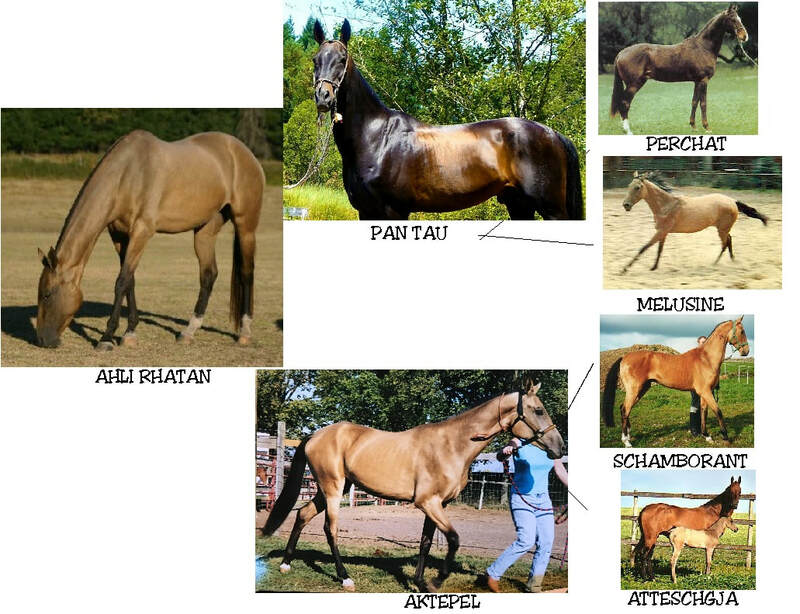 Pan Tau is by Perchat and out of Melusine. Imported from Germany. 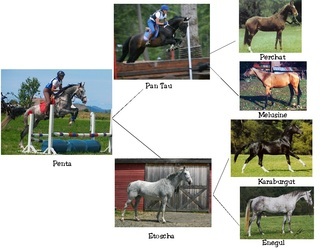 Approved German-Qualified Breeding Stallion. 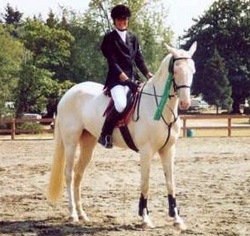 Pan Tau received the highest grade, competing against all other breeds, from the German Horse Association at his initial inspection. 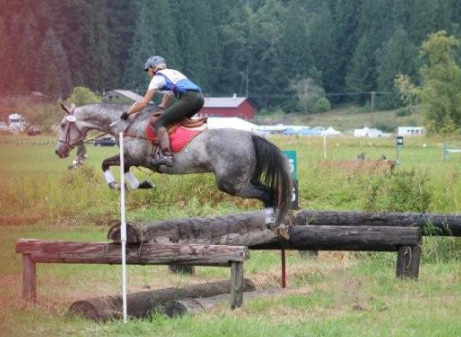 Pan Tau has competed in Three-Day Eventing to USEA Training Level, and has schooled to Preliminary level. 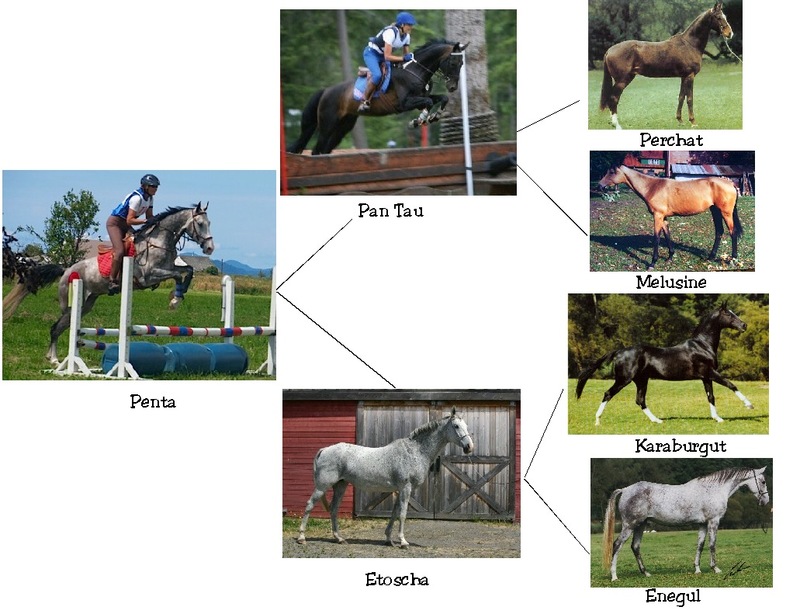 As a breeding stallion, Pan Tau passes his best traits onto his offspring: a sweet and level-headed character, sportive athleticism, and exceptional conformation. 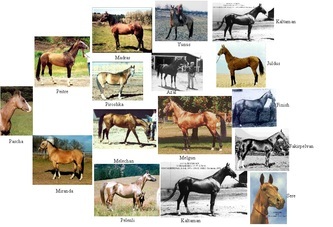 To view some of Pan Tau's offspring, please see below. Live Cover only. Call for information. Pan Tau is Negative for Naked foal syndorme. Pan Tau at 19 years old. Pijk Batyr means courageous cat. 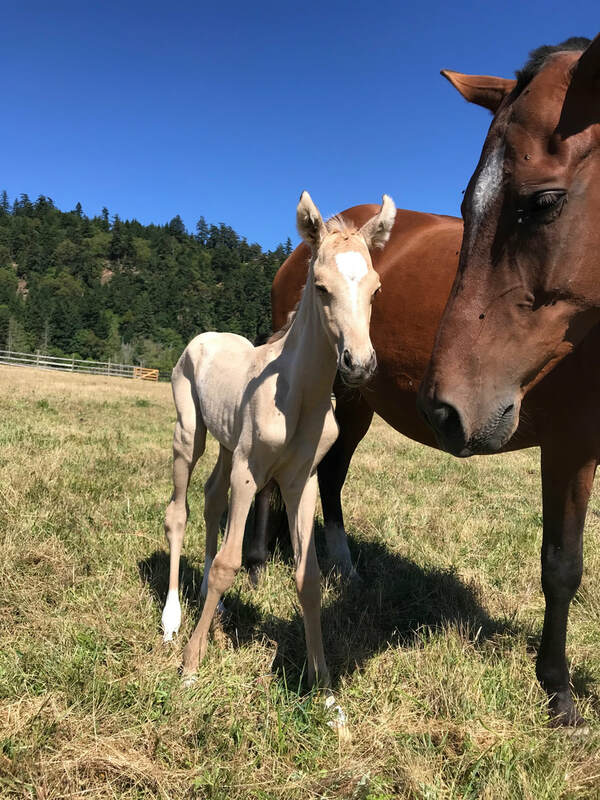 He's an outgoing little man already in his first week of life! 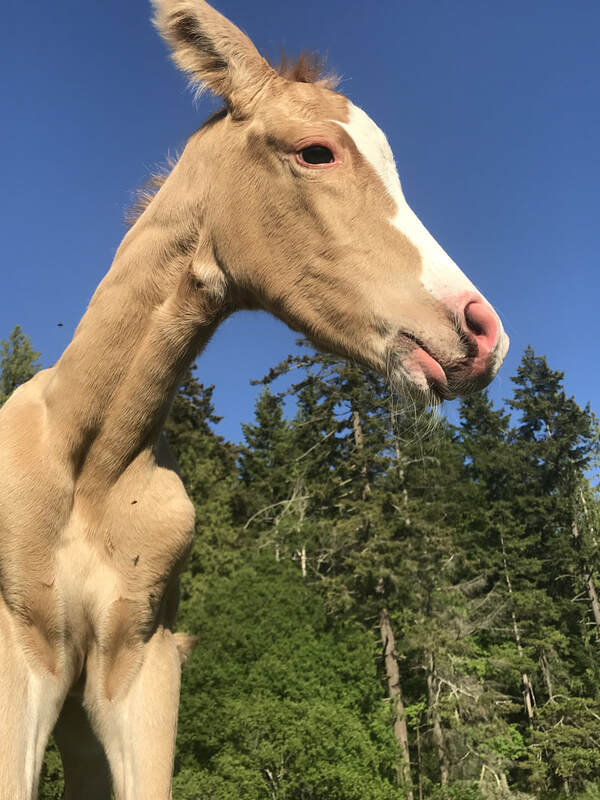 Born in the morning of June 19th. 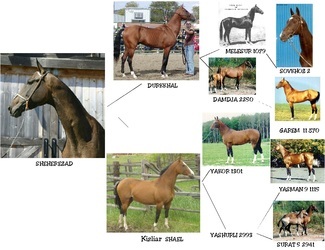 Kamil Jorap means "perfect socks". Aktepel was imported from Switzerland. 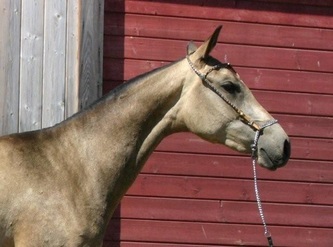 She is a metallic buckskin with lots of sheen which she passes on to all of her offspring. Outstanding broodmare with a super sweet disposition. 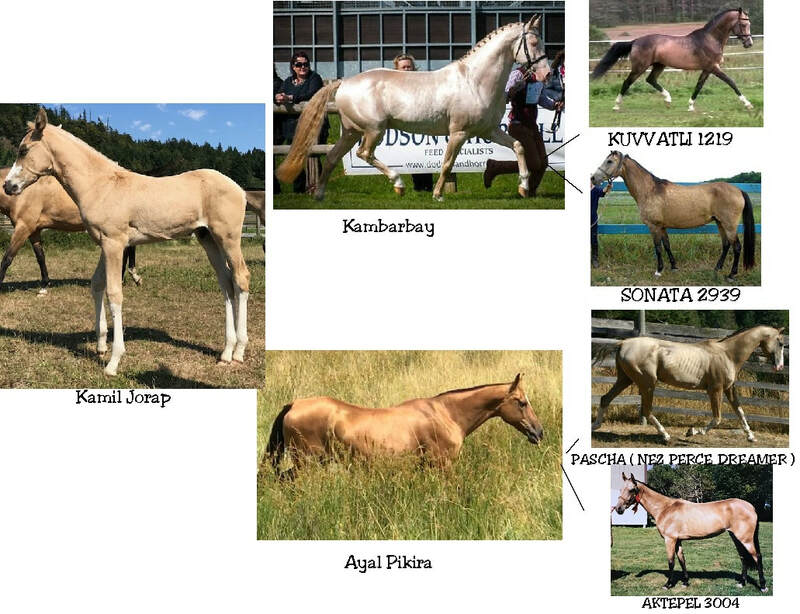 Aktepel is Negative for Naked foal syndorme. 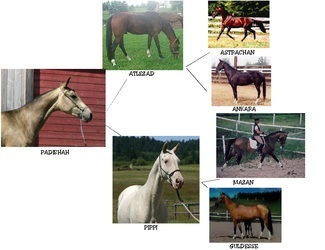 Ahli Rhatan was bred by Sweet Water Farm Akhal-Teke. 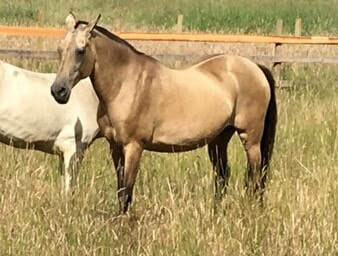 Beautiful metallic buckskin mare by our stallion Pan Tau. 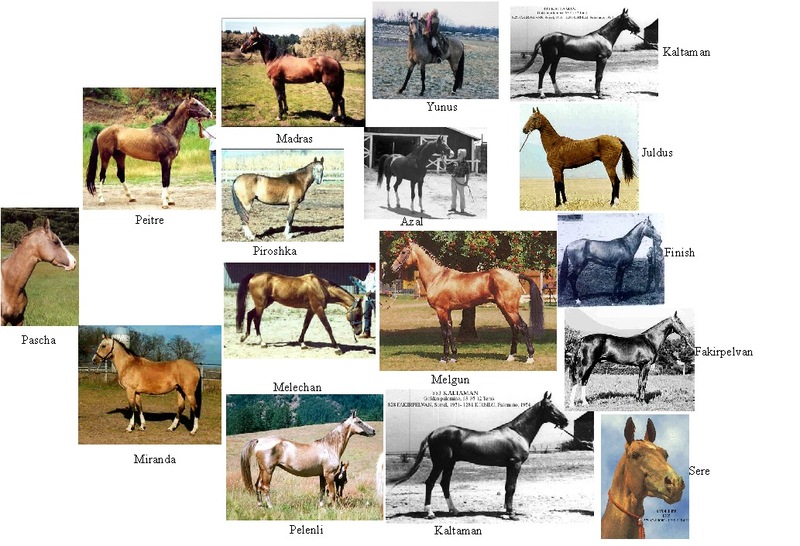 Ahli is Negative for Naked foal syndorme. 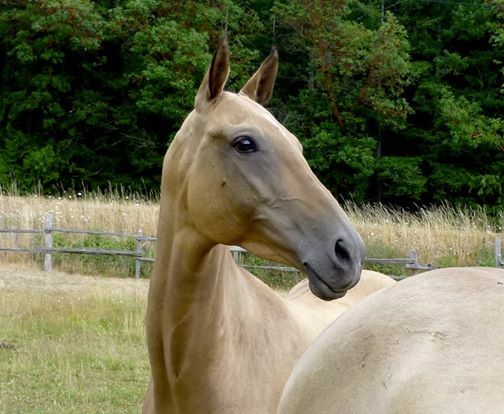 Shirin was born and raised at Sweet Water Farm Akhal-Teke. 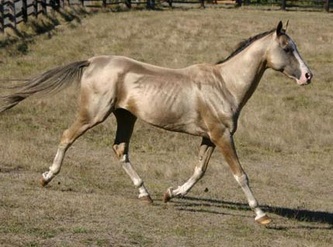 Stunning metallic palomino with unique facial markings and four white socks and a belly spot. Shirin is Negative for Naked foal syndorme. We call her "Pika" for short... she is the older full-sister of Altyn Gush. 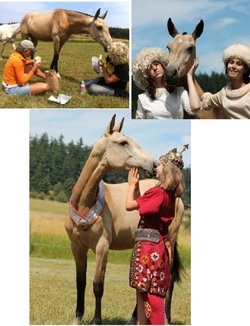 Pika is very sweet... and very metallic, a trait which she passed on to her offspring. 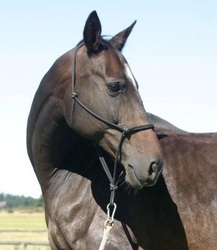 She has stunning type and a beautiful face. She is a full sister of Altyn gush. Pika is Negative for Naked foal syndorme. Sheherezad is Negative for Naked foal syndorme. 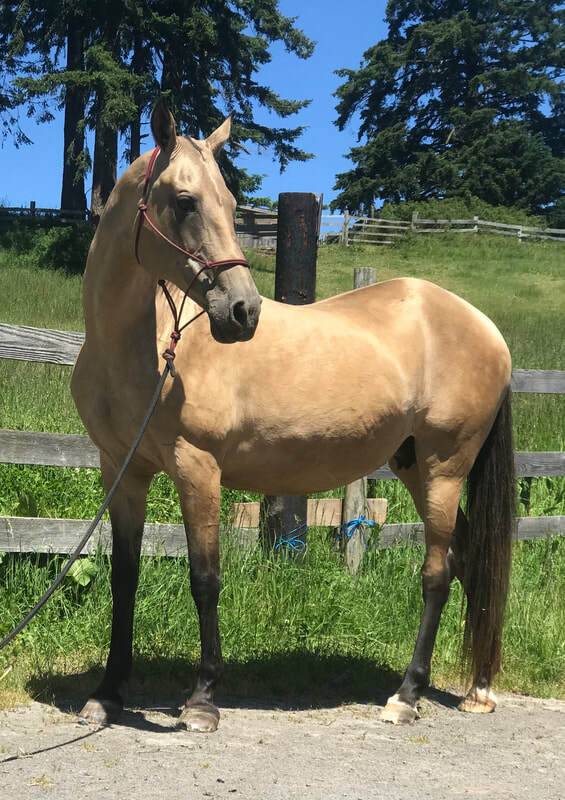 Maralle is a very sweet mare. 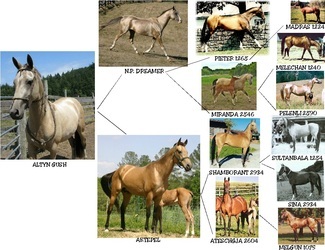 She has great conformation and is a valuable broodmare. 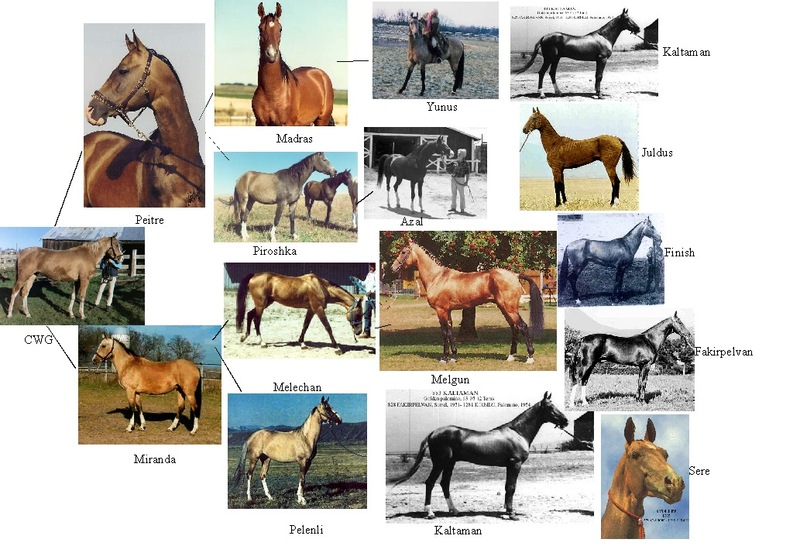 Maralle is Negative for Naked foal syndorme. 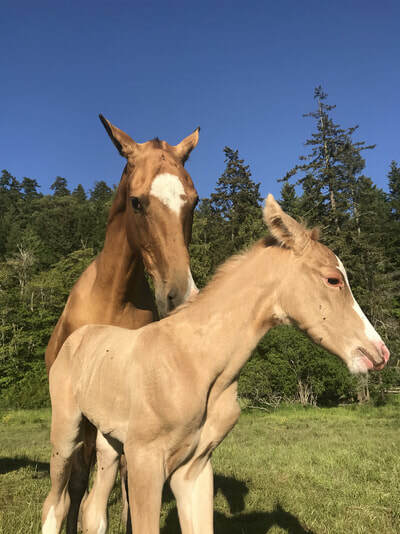 Filly was born May 16th. She has one sock and a star. She is very sweet and elegant with a submissive personality. 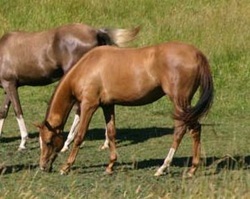 Aykyssa is Negative for Naked foal syndorme. 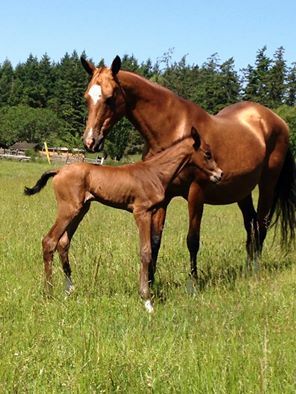 Filly born early morning of July 17th, 2015. Saz Jahan means Musical World. 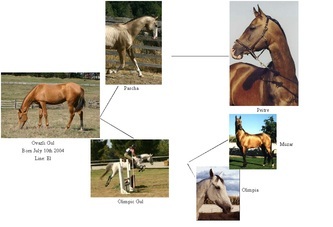 Saz is Negative for Naked foal syndorme. 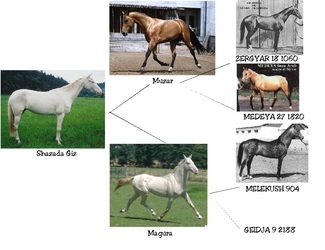 Ak Hadysa means "white phenomenon" in Turkmen. 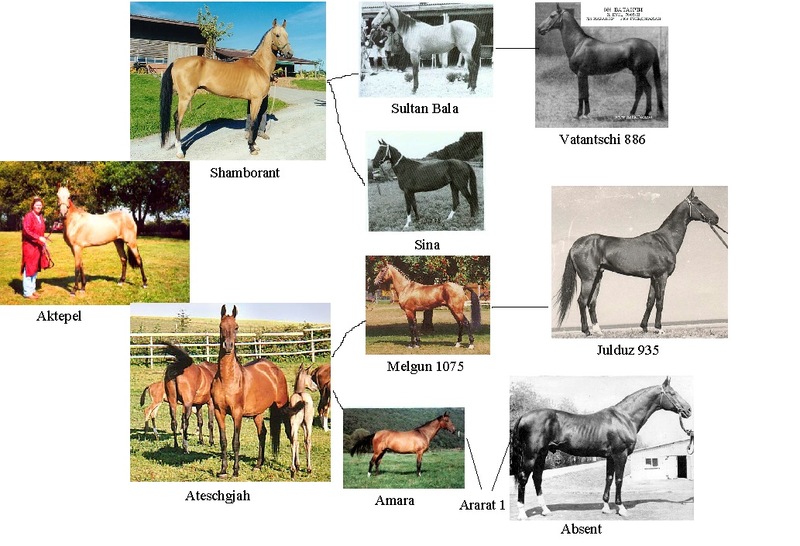 Hadysa is Negative for Naked foal syndorme. Asuda Ganat means Peaceful Wing. 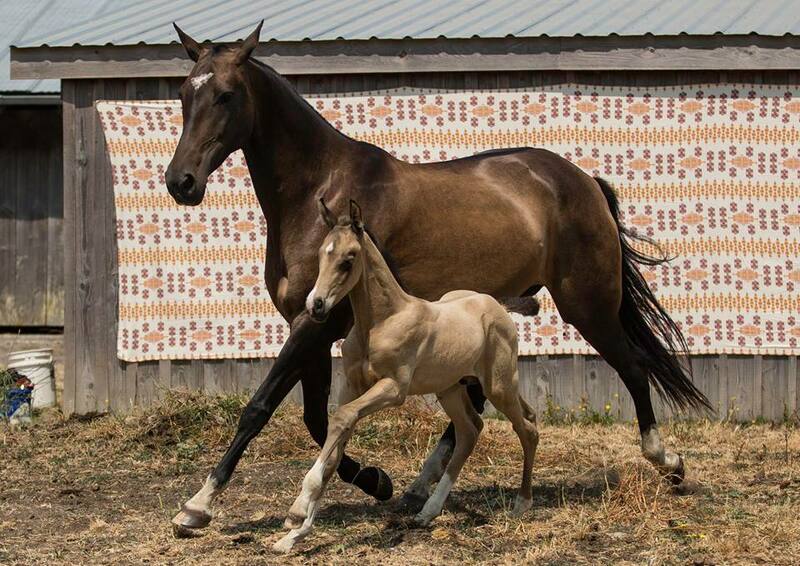 She was born on the morning I was to fly to Ashgabad, turkmenistan for the International Akhal-Teke comnference, April 24th. 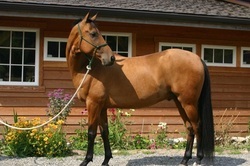 She is super ourgoing and sweet, just like her older sibling! Merwerit was born on the morning of June 25th, 2018. 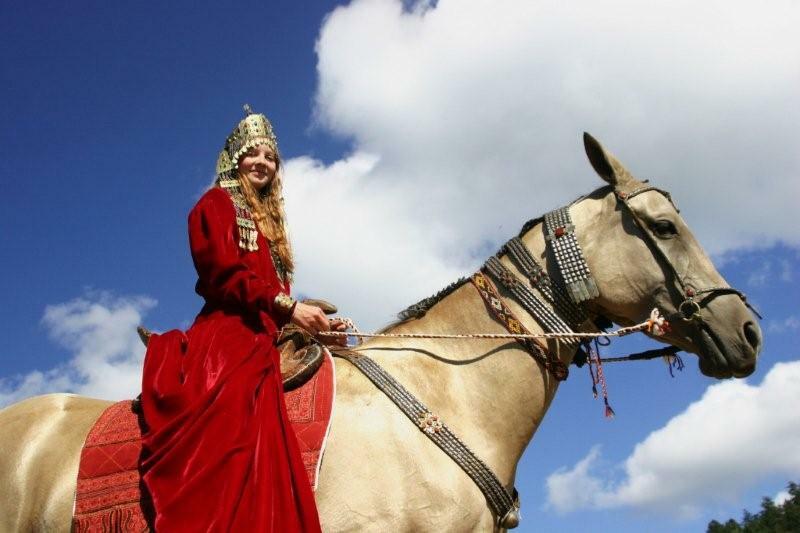 Merwerit means pearl in Turkmen. I am super excited for this cross as I think Aliger is a fabulous stallion who unfortunately does not have a lot of offspring. Since Aliger is from 1995 I feel extremely lucky to have a foal by this older stallion! 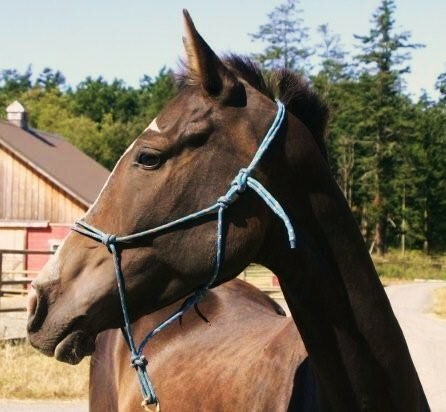 His name means "made of magic". Edeelen has been handled from birth and goes on trail rides on a lead line. He already is good with traffic even dump trucks on narrow roads! He has been gelded and should make a teriffic sport horse! 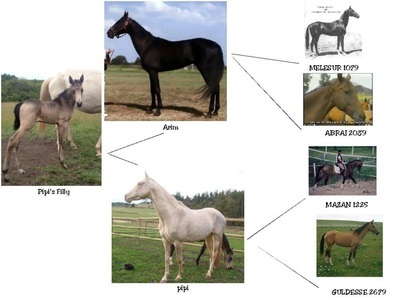 Edeelen is Negative for Naked foal syndorme. 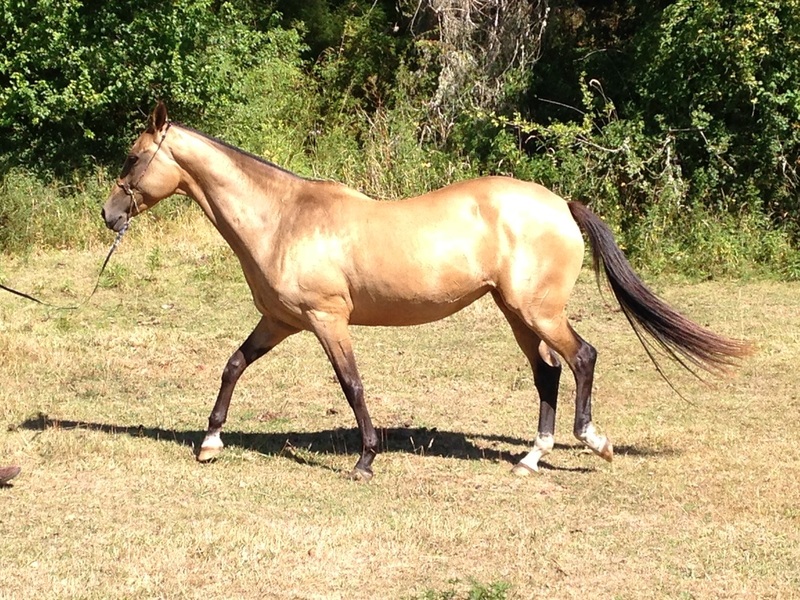 DP is a 16 hand gelding with beautiful movement and a sweet disposition. 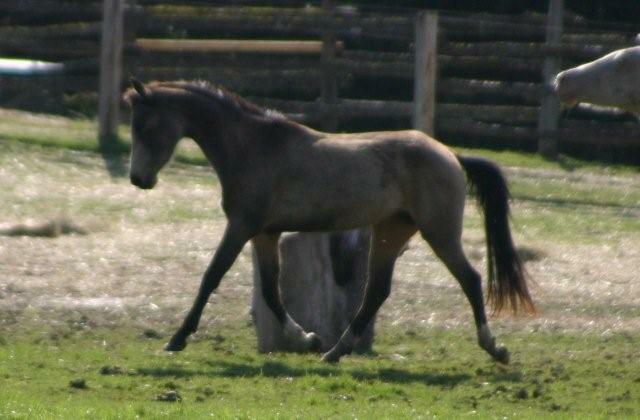 He is currently in training for dressage and jumping. 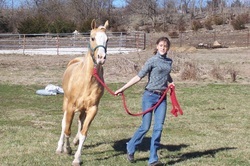 Tondar is learning the "ropes" of Natural Horsemanship. He is a joy to work with and a fast learner. We are excited to see what he will excell in! Paktaly was bred, born and trained at Sweet Water Farm. He is one of our favorites! 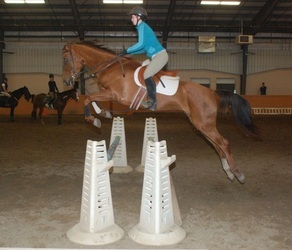 Paktaly is an amazing athlete and loves to jump. He is a steady mount for students... and great on the trails. 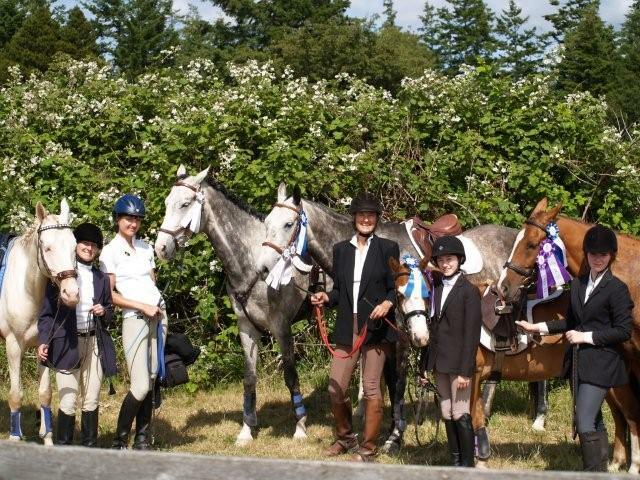 But most of all, we compete him in three day eventing and look forward to seeing him progress up the levels. 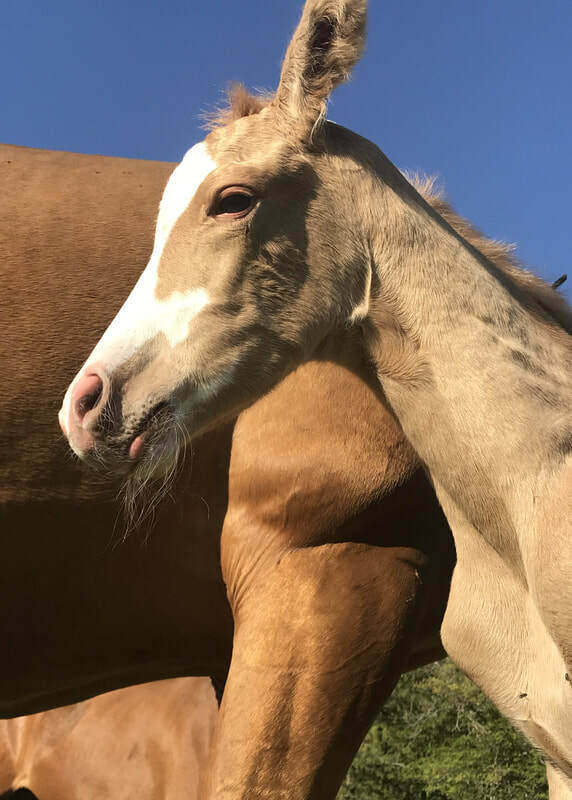 She was born on May 20 and is the biggest foal I have ever seen! 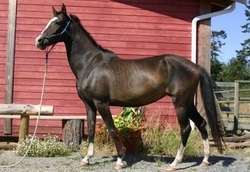 She is going to be a beautiful horse! Kegas is naturally good tempered. 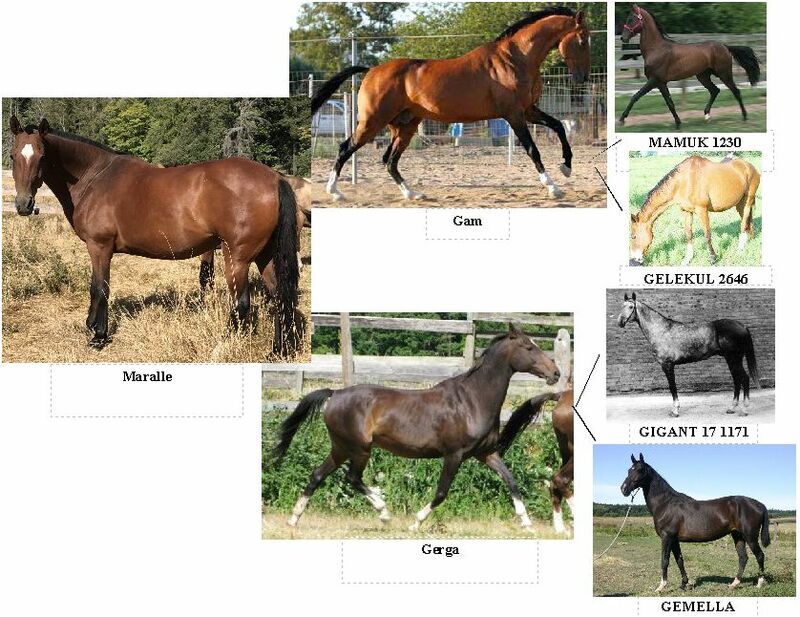 Some breeders say Cremellos and Perlinos are easier to train... and so far, all the Cremellos and Perlinos we've handled are very mild-mannered. 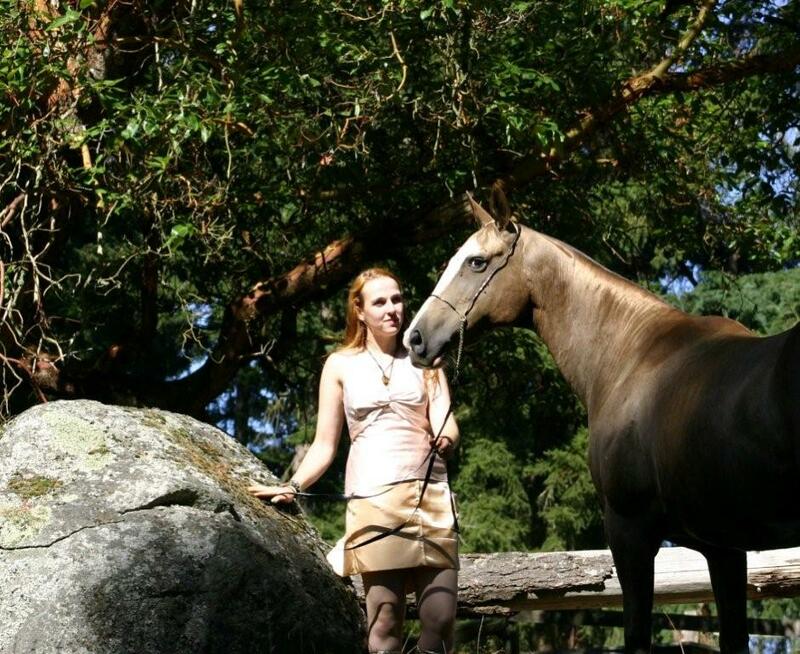 Kegas has a great work ethic, and can be trusted with the smallest children and the most inexperienced beginners. 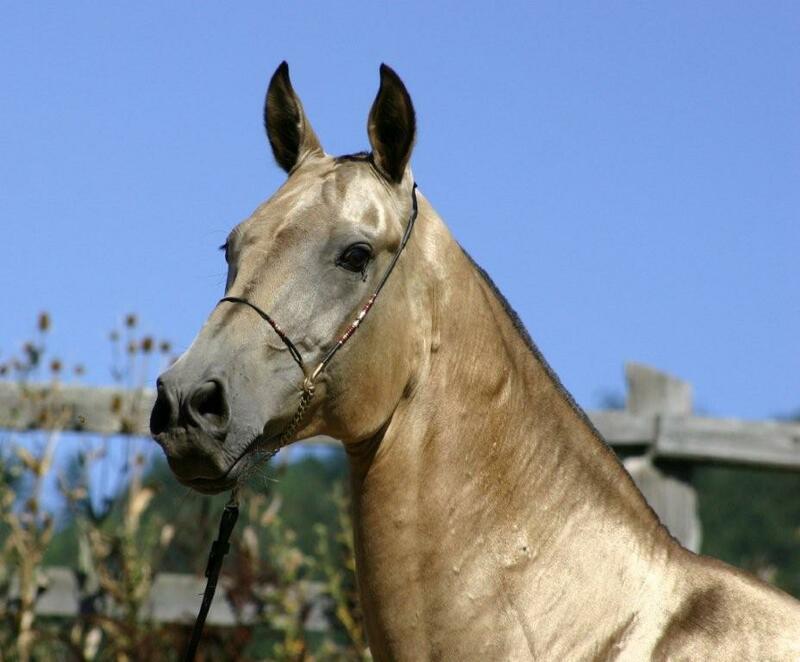 For the more advanced rider... he shines as he becomes a very handsome-moving fellow. 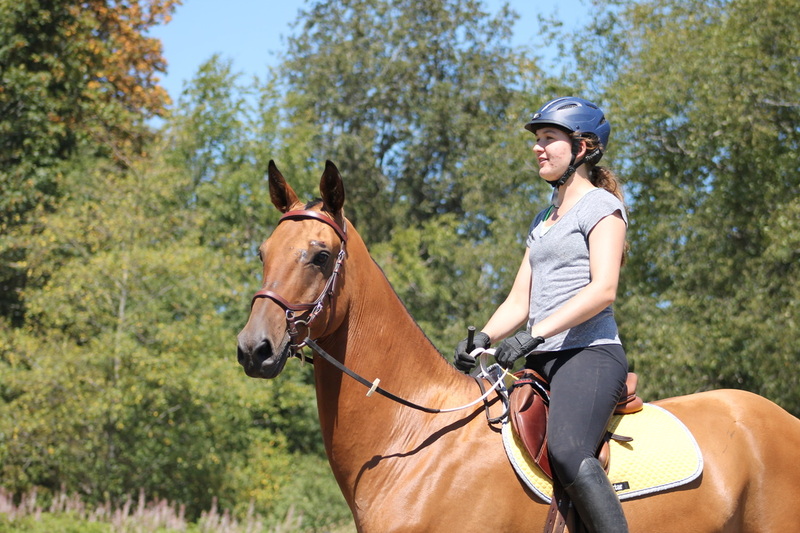 Kegas is a great asset to our riding program. 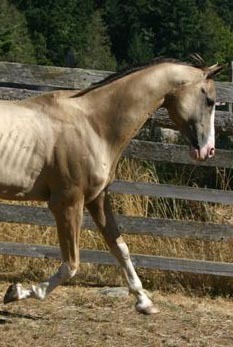 Leucosia is a cremello. 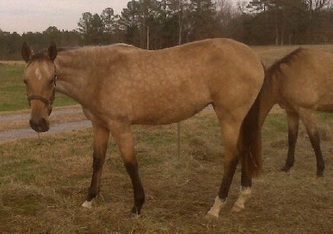 We call her "Losha" for short... she is a very beautiful filly and her pictures don't do her justice! 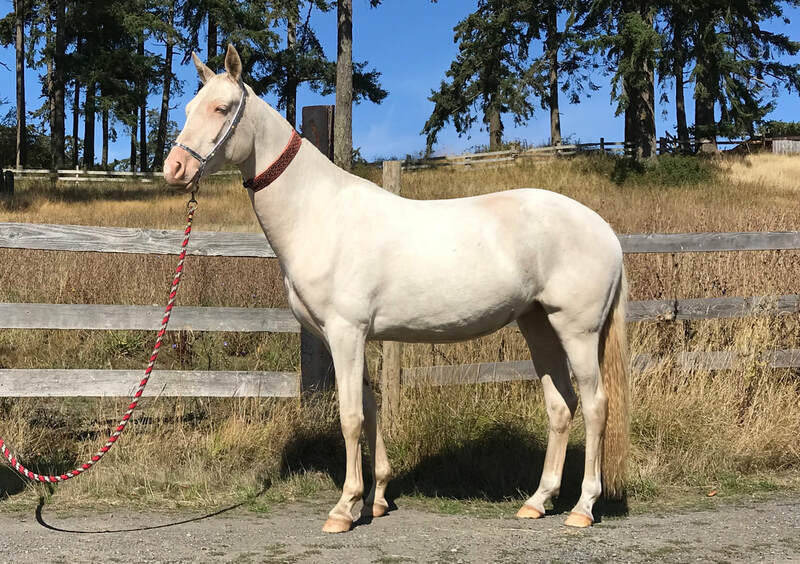 She is extremely typey and and as pretty as can be! 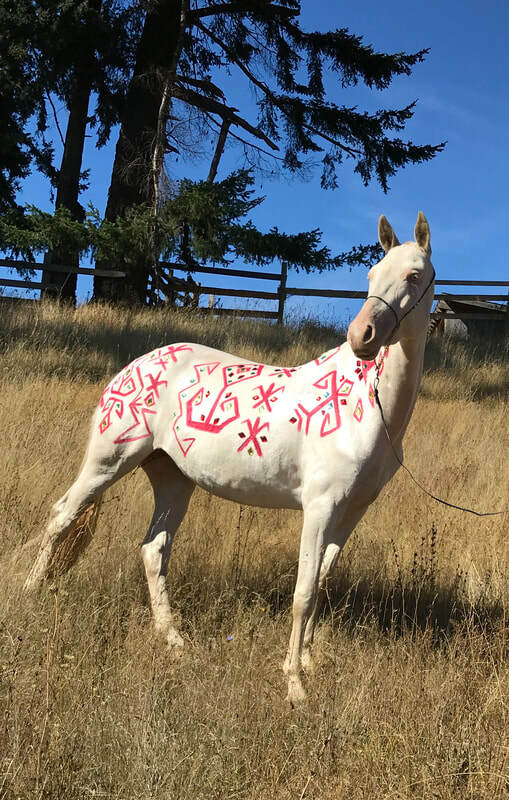 Our young students call her the "Unicorn." She keeps the Cremello tradition in honor in that she is very mellow, easy to handle, and a pleasure to visit with in the pasture. 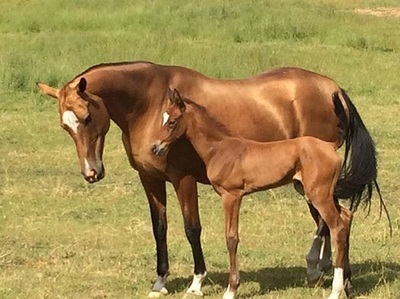 Filly born May 29th, 2015 by Pan Tau and Ayal Pikira. 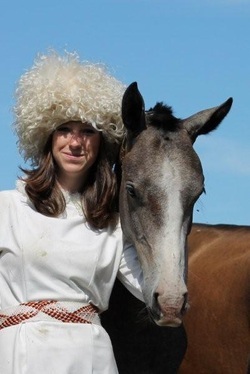 She has a speck of blue in her right eye just like her full brother Talk of the Turkoman. Her name means Elegant Fairy Candy. 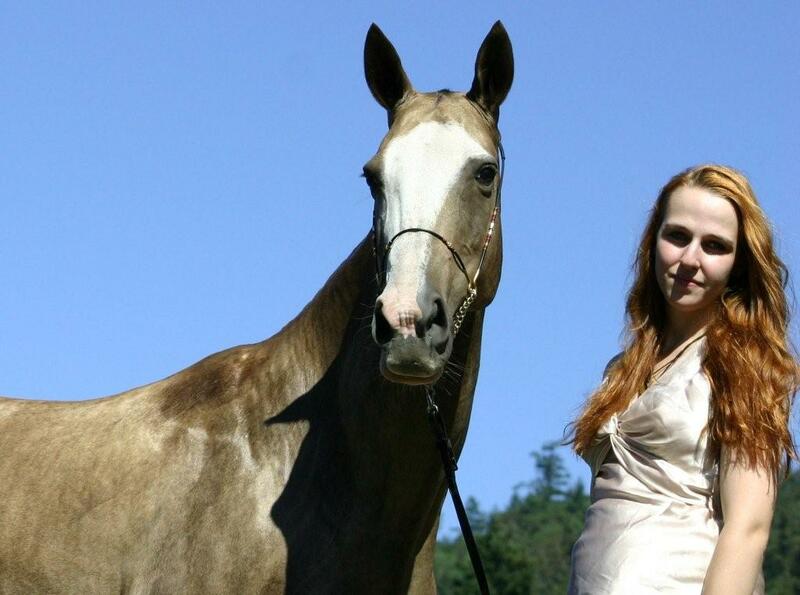 She is very beautiful and elegant. Arslan was born April 29th at 3am. 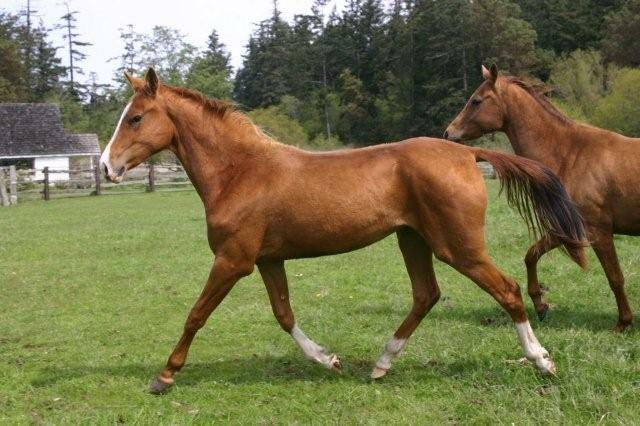 He's a big foal with 4 socks and a blaze. His name means Lion Socks. 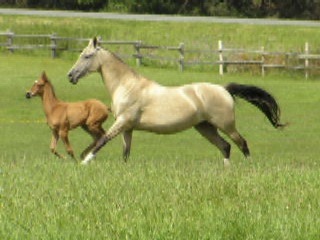 He is bold and outgoing even at this young age. Ak Farfor means White Porcelain in Turkmen...very fitting for him.. He is very handsome and has the chiseled features just like his dam. He has a great character and likes people. 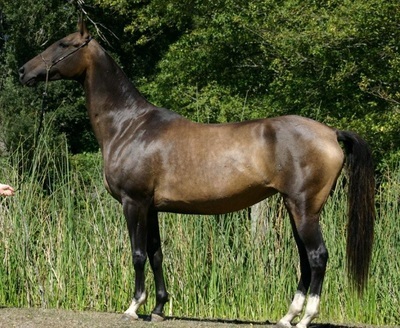 He will stand at stud in Kansas. 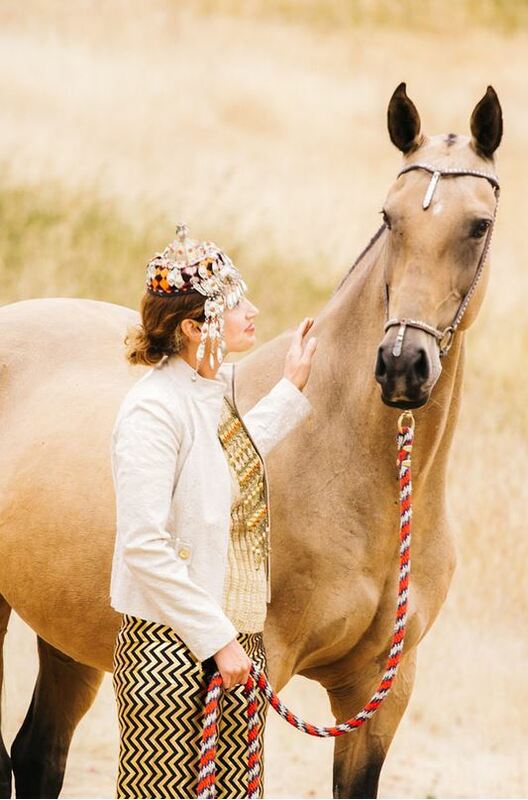 Altyn Gush has the most incredible metallic gold sheen and on summer days she stops traffic on West Valley RD! We call her "Gullie" for short. 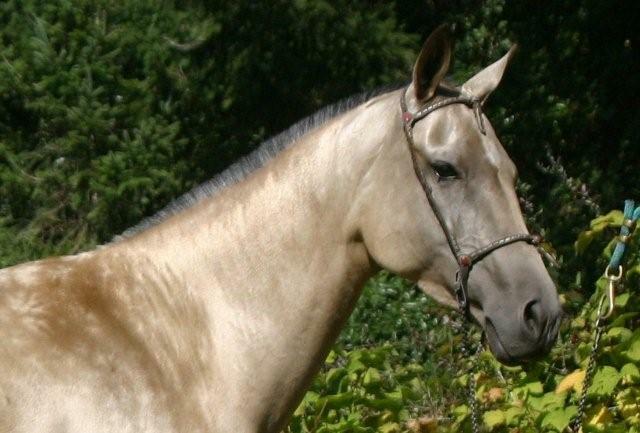 Pictures don't do her justice! 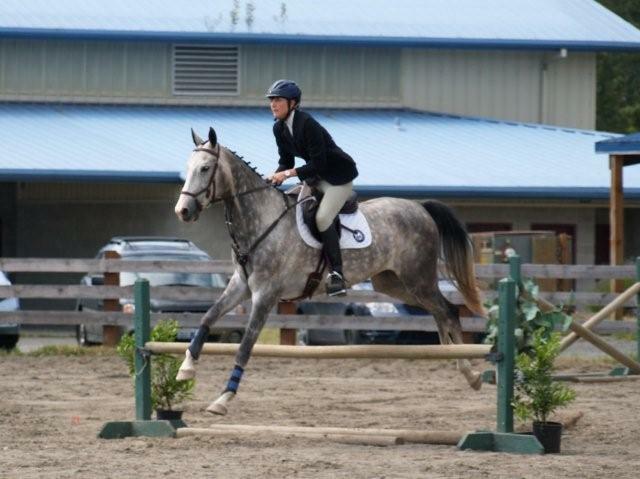 She is very sweet, loves people, and has nice form over fences. She is very smooth to ride, and is very easy going. 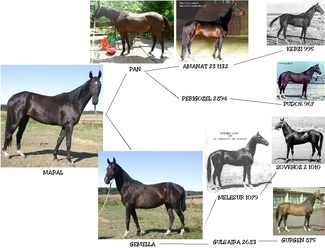 She is a full sister of Ayal Pikira. 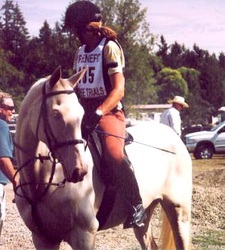 Pipi is a cremello. 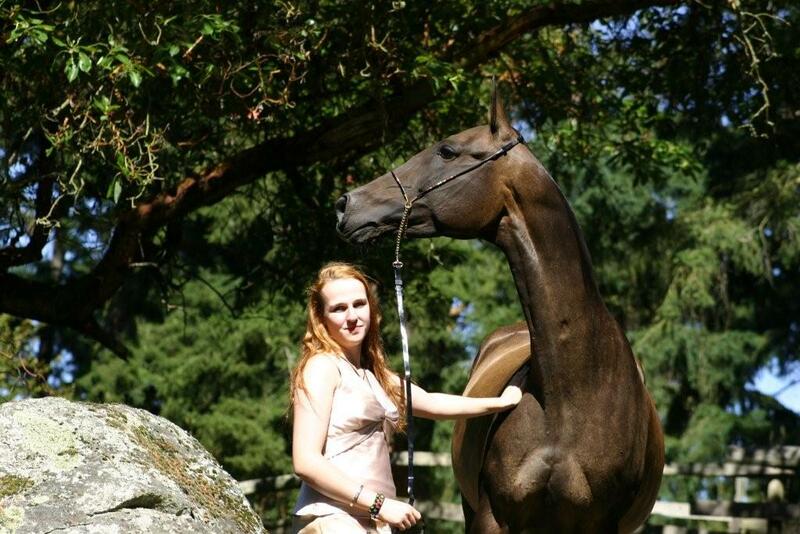 She was imported from Germany as a youngster. 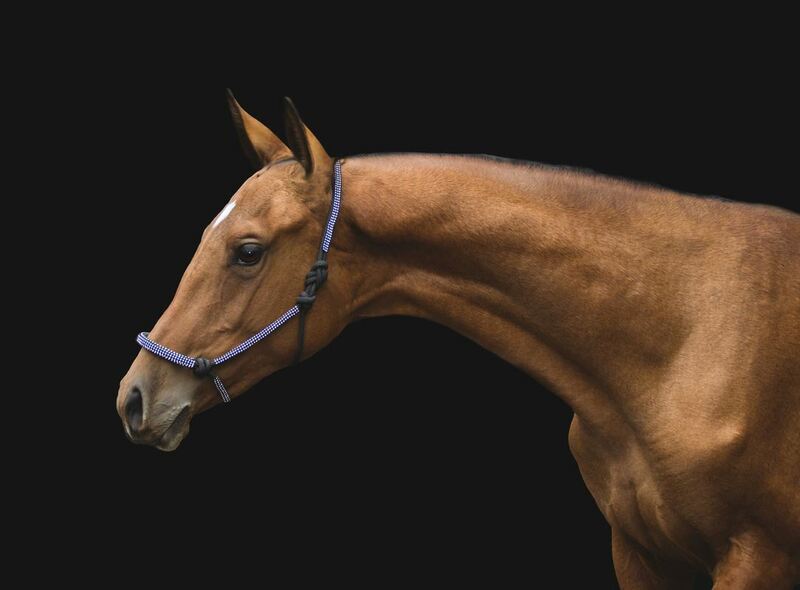 She is one of our favorite mares... and not only because she strikingly beautiful! Pipi is tall, athletic, and moves like a grand prix dressage horse. She is stout and powerful without lacking elegance. 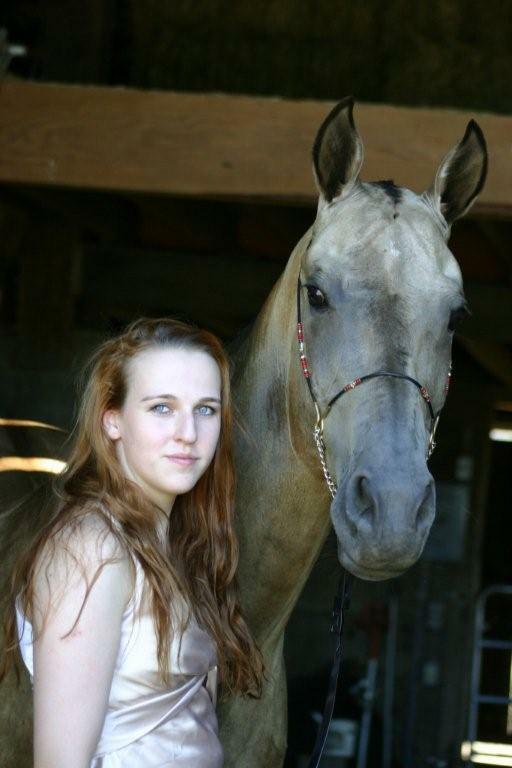 She is also very intelligent and has a sweet disposition. 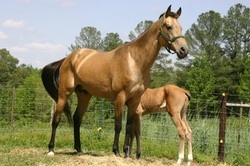 We are so excited to have her, and can't wait for her foals! 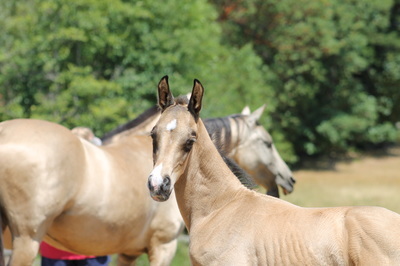 Born Saturday July 21st, 2012 at 8 am. Ak Tultuk is graying out, and growing tall. 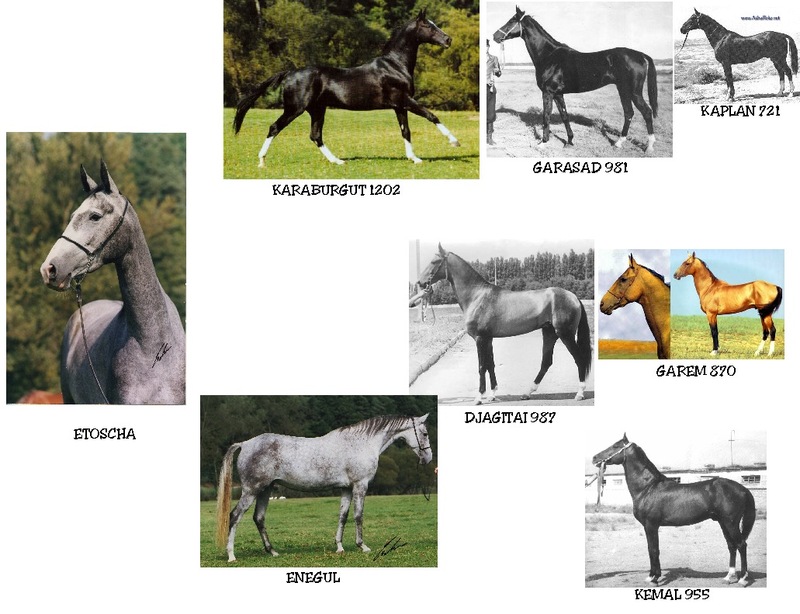 His dam's sire Karaburgut was imported from Turkmenistan. His dam and sire are imported from Germany. 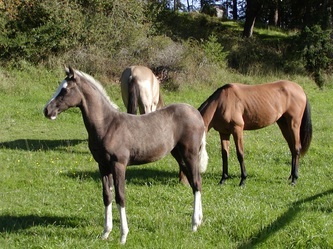 Ak Tultuk is the last foal Etoscha had. 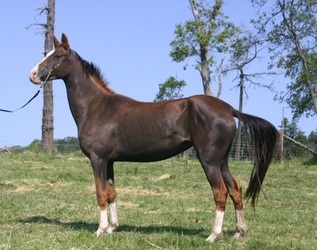 Talk of the Turkoman is a very flashy colt with one blue eye and one brown. 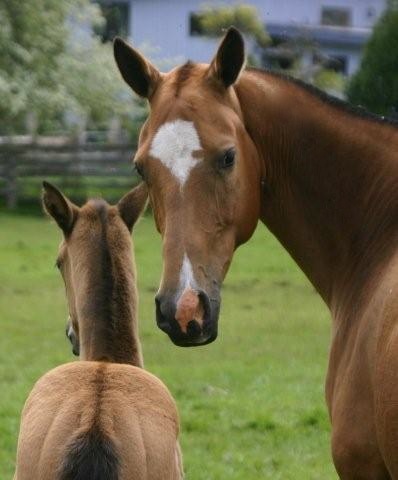 Out of the 3 foals born in 2011, he was the most curious and friendly from the very beginning. Very easy going and sweet. Kara Gush means black bird in Turkmen. 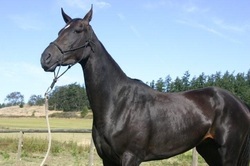 She is closely related to our handsome gelding Pasabi. 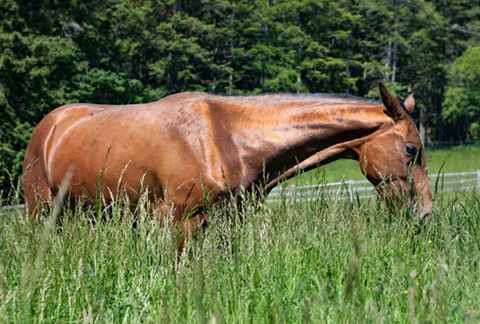 Pasabi is a one-of-a-kind gentle soul. 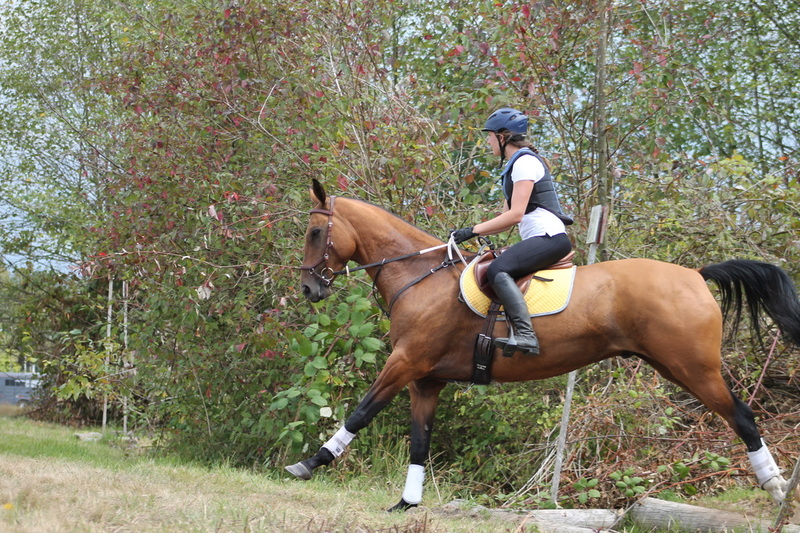 All 16 hands of him are as sweet as can be and totally unflappable on the trails, roads, and cross country course. He never bats an eye at water, ditches, flowers... or other funny-looking stuff! 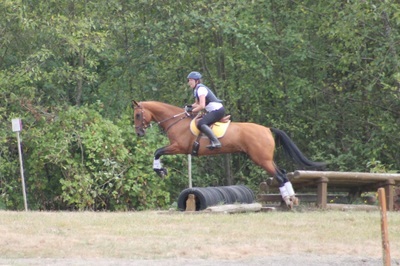 He is a favorite of the kids to ride, as well as Jenny's precious eventing mount. 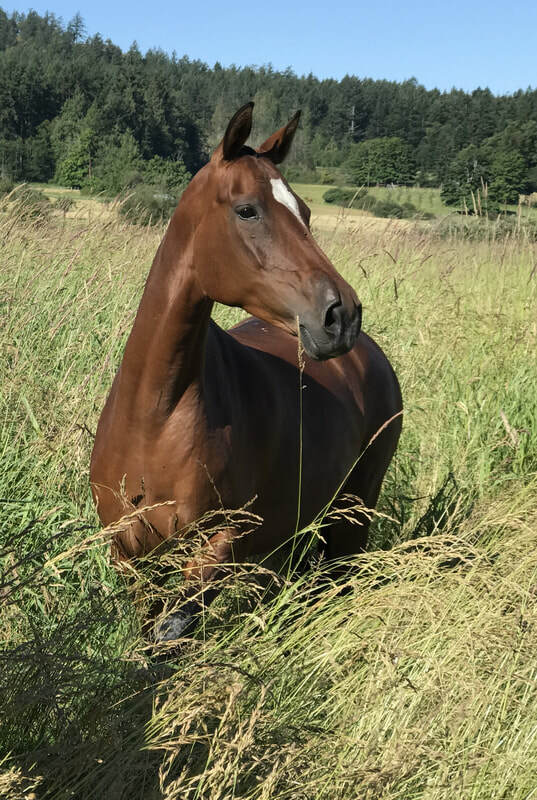 He is a joy to be around and we are proud to have such a horse at our barn. Besides numerous unrecognized shows, Pasabi won 5th place at aspen Farms horse trials, USEA recognized event. We are very proud of his 15 year old rider, it was her first recognized show! 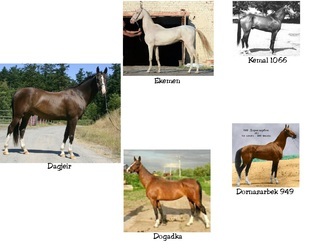 True Turk is nearly a carbon-copy of his older brother, The Desert Prophet. We are so excited about these two! 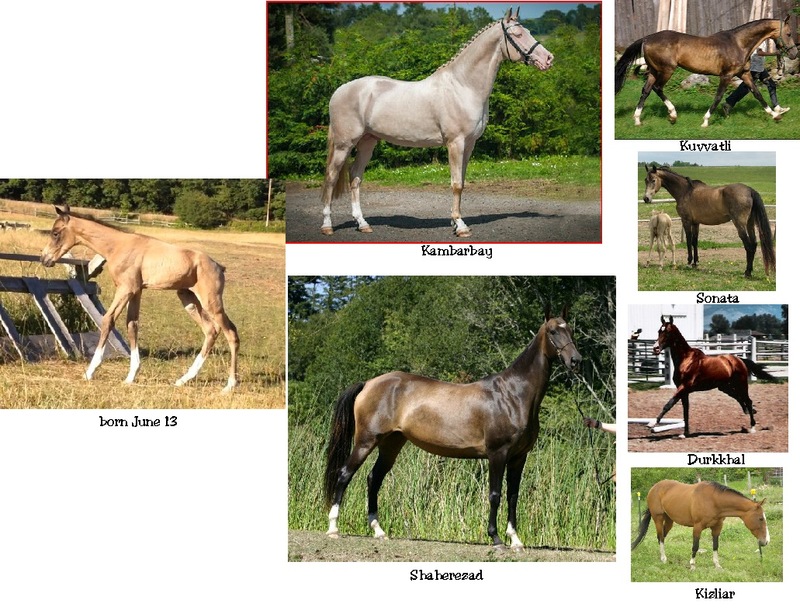 Beautiful movement, exceptional bone, and outstanding conformation.They are tall, handsome, and practically perfect in every way! 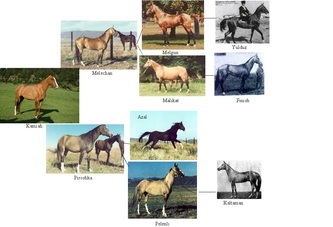 True Turk will mature 16 h or taller. 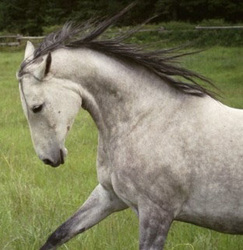 Annagul means " a beautiful girl who was born on a Friday". She is extremely friendly, and has a very feminine face. Hallygul, meaning a girl with a birthmark that is as beautiful as a flower. 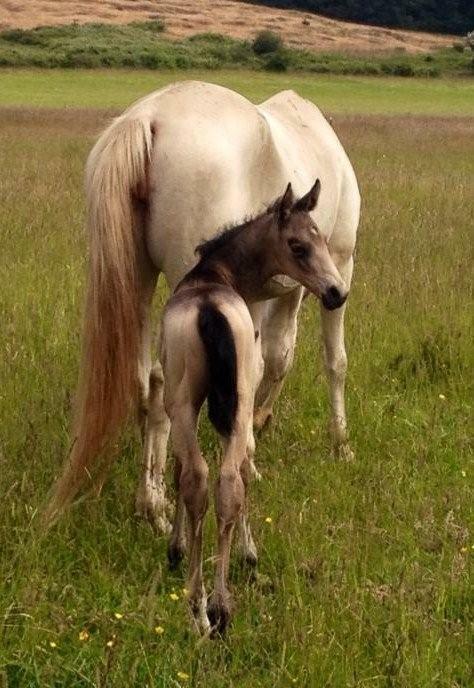 We are sad to see her go, but she will contribute to the breed and we wish her many excellent foals! 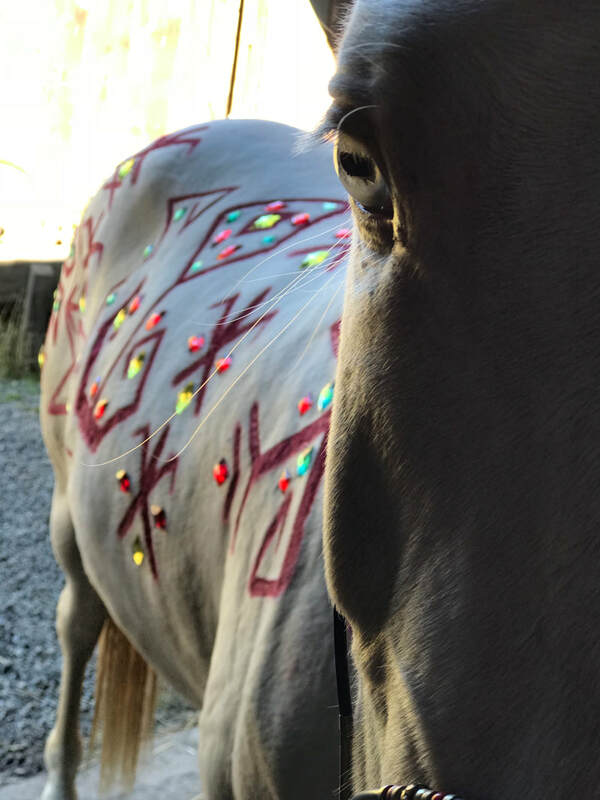 He will remain at the farm! Etoscha was bred by Sabine Toepfer-Gerbert in Germany. 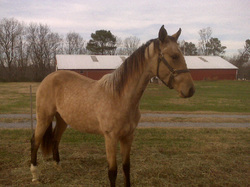 "Tina" for short... she is an outstanding broodmare. 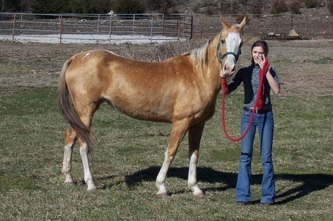 She is very sweet, loves to be scratched, loves attention and follows us all over the pasture. 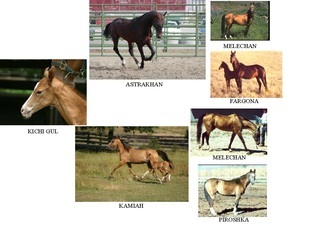 Her foals are exceptional and amazing athletes. 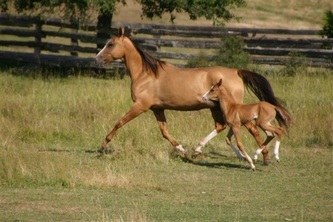 She has a gorgeous trot that she seems to pass onto all of her foals. 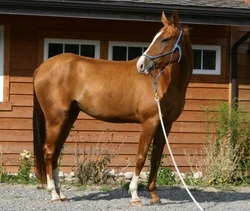 Very sweet gelding, tries his hart out for you. 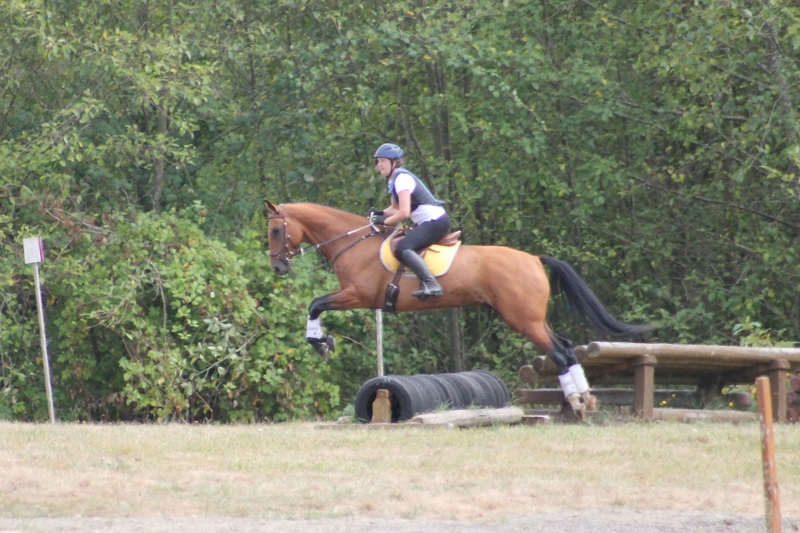 Ulduze has been trail riding for a year, and is schooling for 3 day eventing. Guzel is a very friendly little girl. 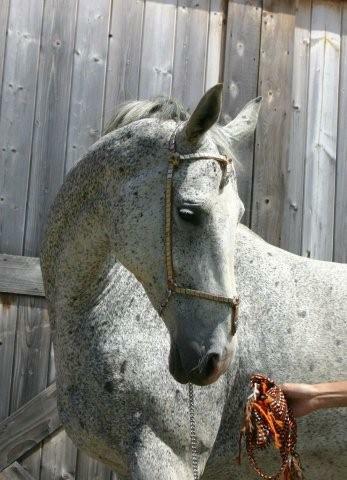 She likes to be pampered and have her "nails done." 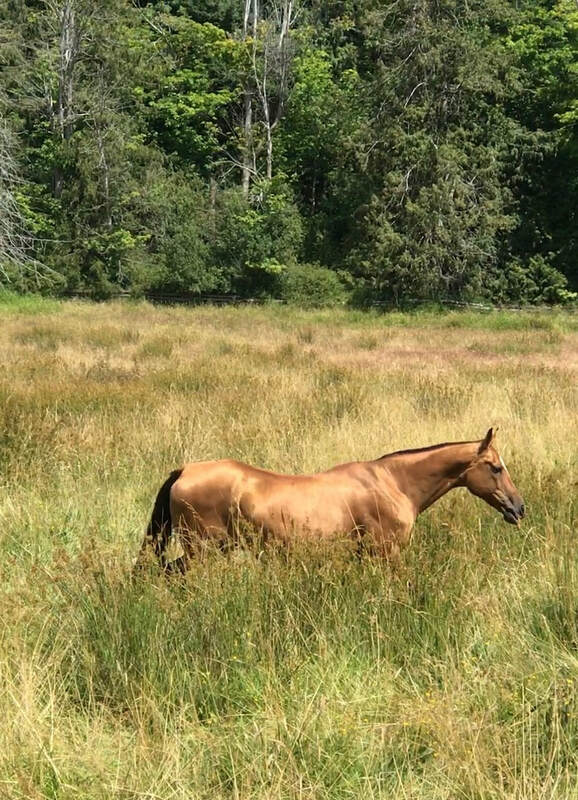 She always comes to greet us in the pasture and follows our students around like a puppy dog . And Guzel is very pretty to-boot! 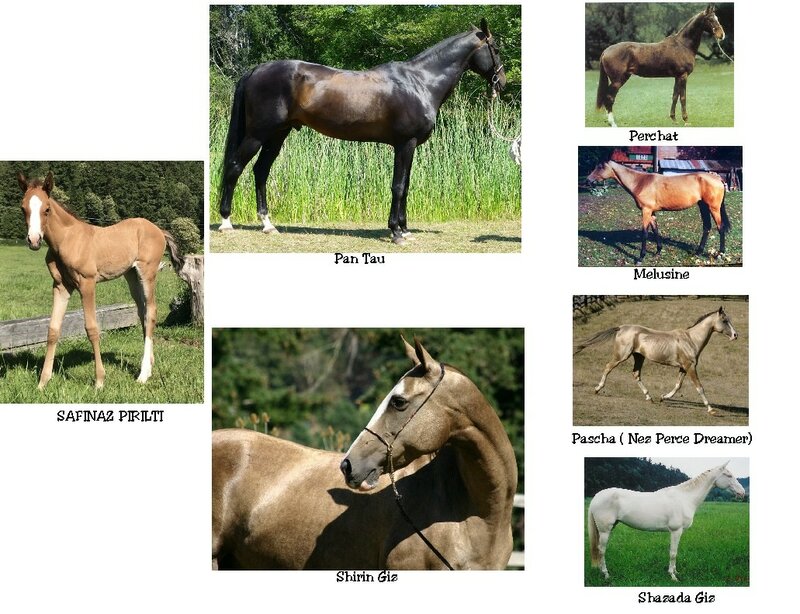 Excellent type, wonderful easy-going temperament, and lots of metallic sheen. 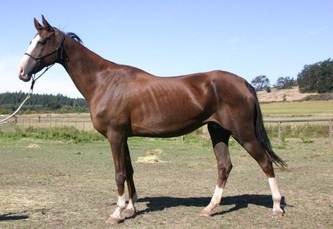 We are very excited about her and hope to keep her as a future broodmare. 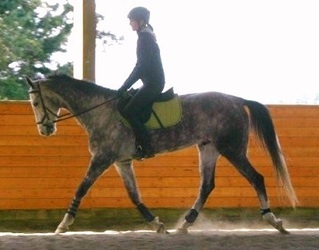 Penta is a very handsome grey, in training for 3 day eventing. He has a great jump, and his sires easy disposition when it comes to cross county jumping. 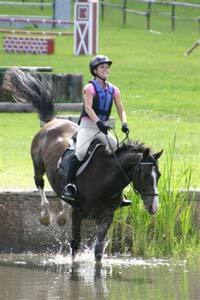 He does not hesitate to jump into water or over ditches. Penta is moving to BC Canada! 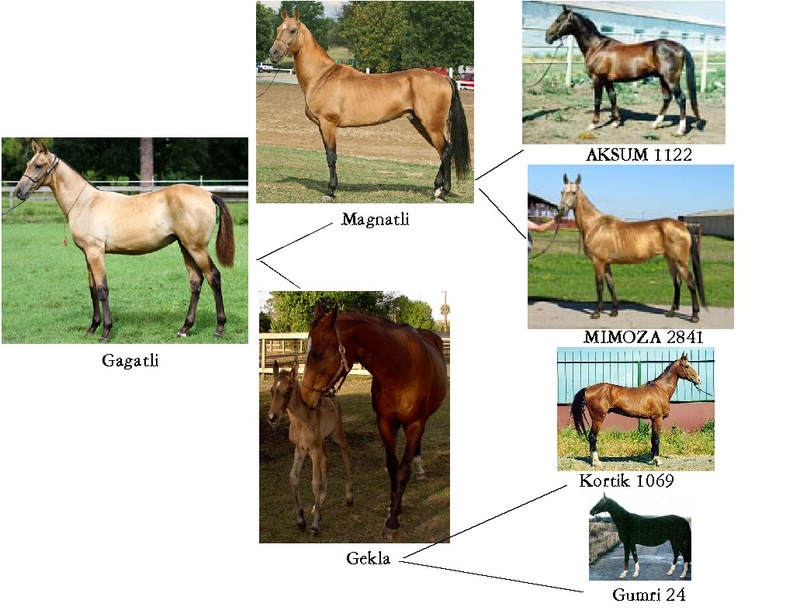 Her rare Ak Sakal bloodlines make her a valuable addition to breeding programs. Gergi is moving to Verginia. 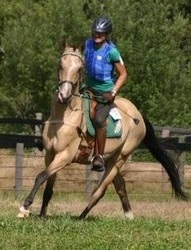 Gagatli is a super sweet filly and green broke to ride. 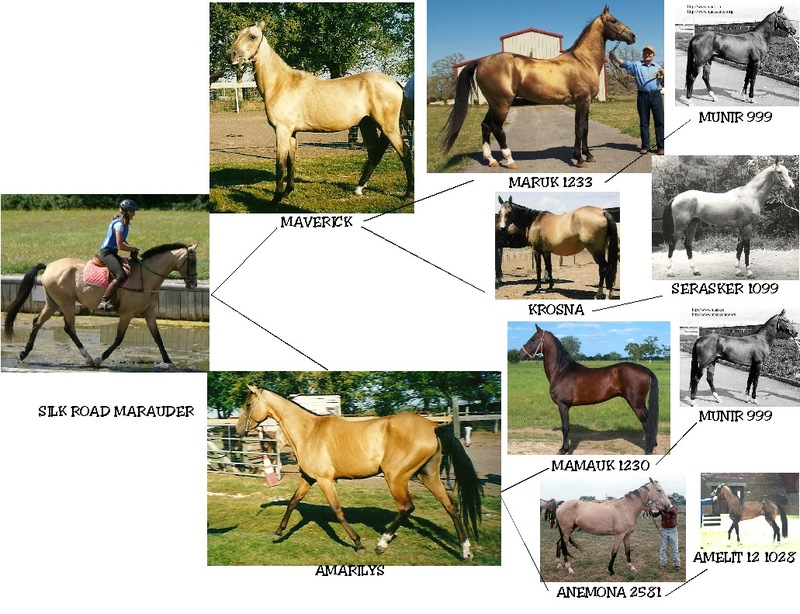 Arab line from her sire and Topoorbai from her dam... these are both rare bloodlines in North America. Gagatli is by the metallic gold stallion, Magnatli, and exhibits the same incredible glow. 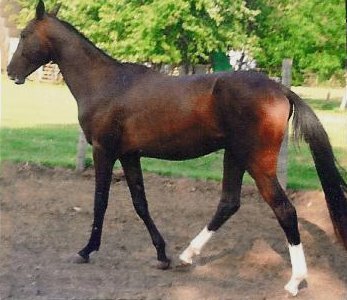 Great disposition, easy to train, and a joy to have at the barn. 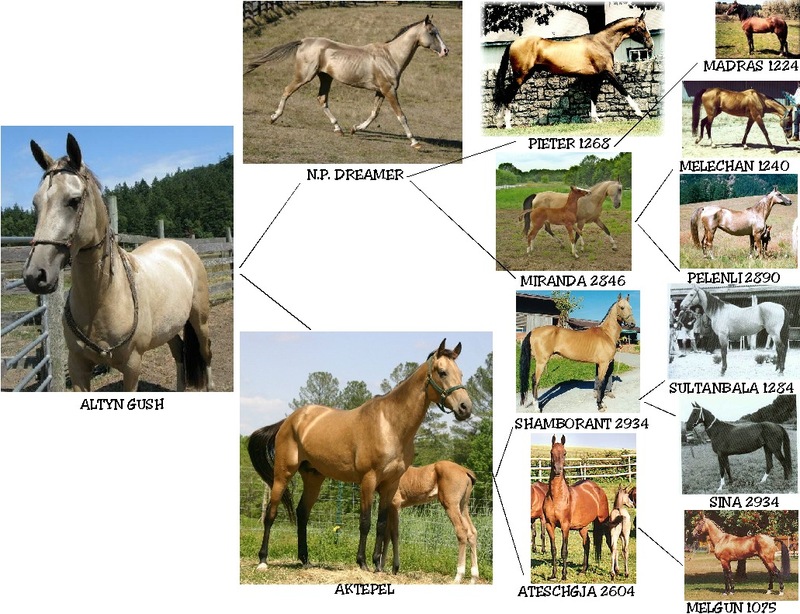 She will mature around 15 hands. She is moving to Verginia. Padisha is a stunning example of the best of the breed. Gorgeous golden buckskin purebred Akhal-Teke filly with elite bloodlines. Perfect conformation with substantial bone and powerful hindquarters... plus exotic beauty with hooded eyes and smoky accents. 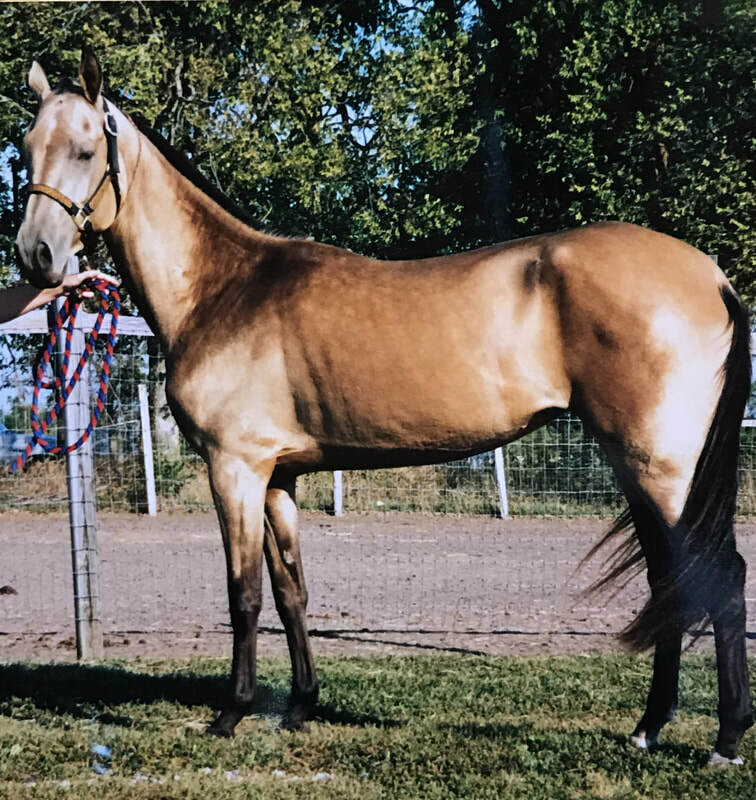 She will be an asset to any breeding program, as well as a jaw-dropping show horse with potential for a variety of disciplines. She is friendly & sweet with excellent ground manners. Easy to handle, mellow personality... great for the farrier and very people-oriented! 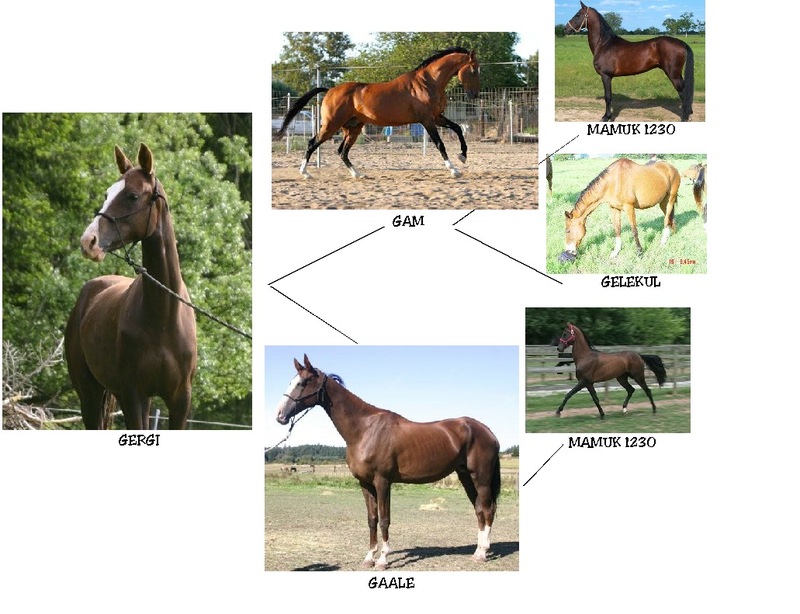 Gaale is a very exotic looking mare. 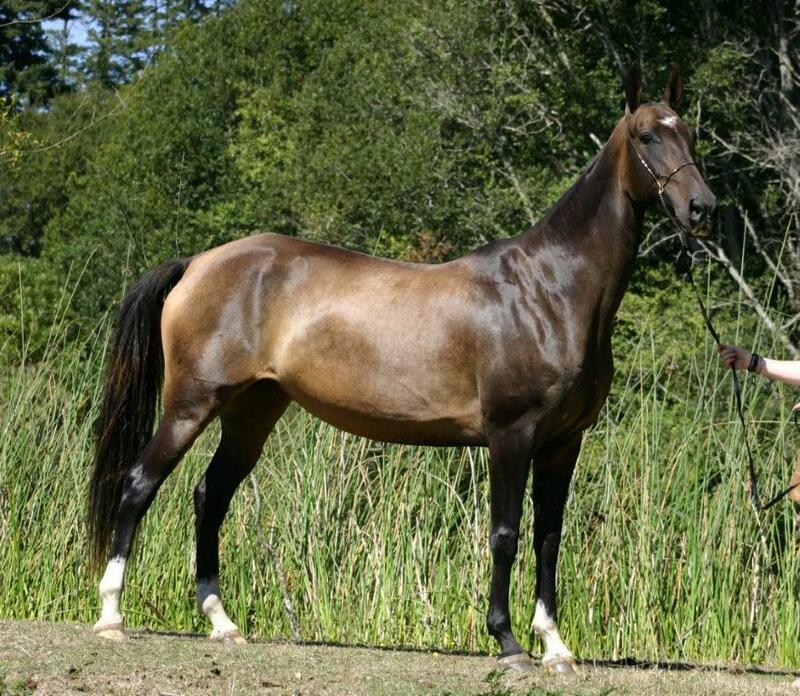 Super shiny liver chestnut sabino. Gerga has a white belly spot, which is a unique sabino trait and rare throughout the world! She has a gorgeous trot, typey face, and a lovely temperament... her foals seem to have her easy disposition, too. 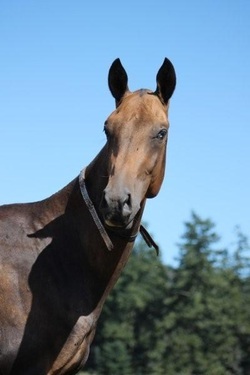 Maral is another sweet mare who loves to be cuddled and scratched. As with many Kaplan line horses, she is black in the winter, but fades to dark brown in the summer when the sun bleaches her hair. 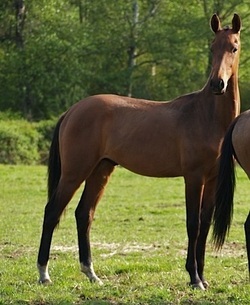 Maral is a very elegant mare with a lovely face and exquisite ears. 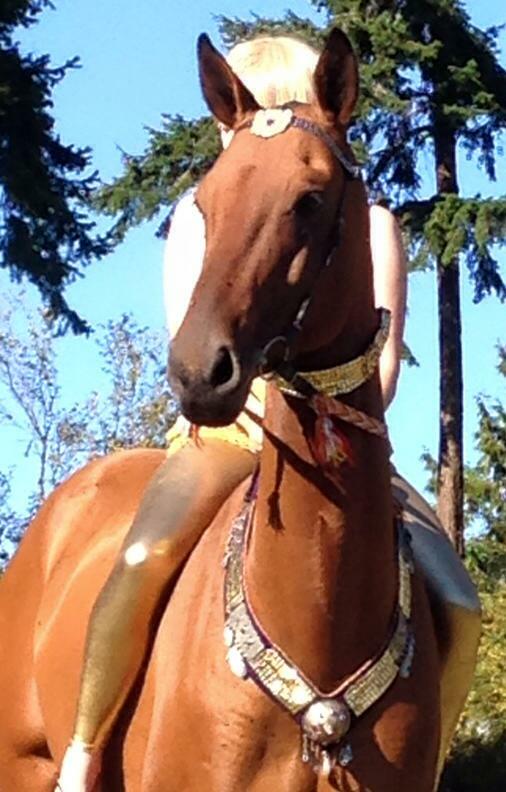 Altyn Gush has the most incredible metallic gold sheen and on summer days she stops traffic on West Valley RD! We call her "Gullie" (Goo-lee) for short. Pictures don't do her justice! She is very sweet, loves people, and has nice form over fences. 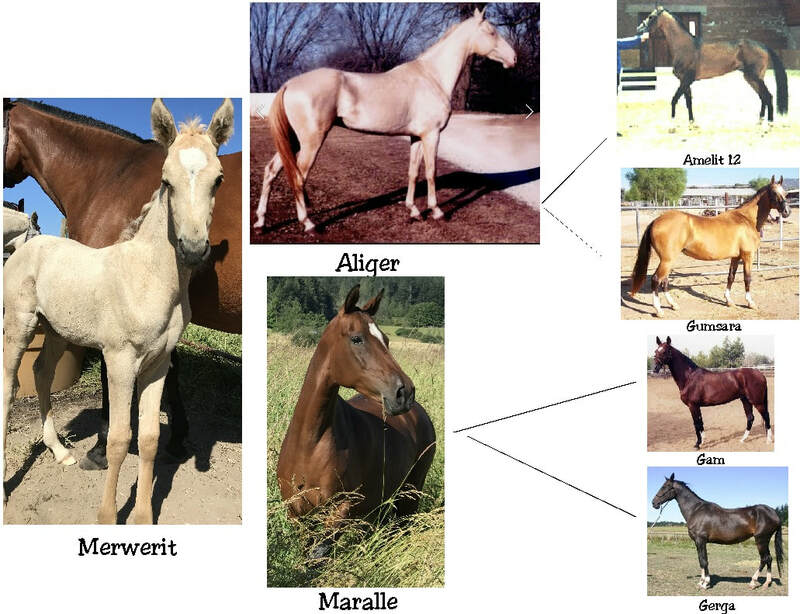 After completing training at Sweet Water Farm Akhal-Teke, she will reside in Michigan at Golden Heavenly horse LCC. 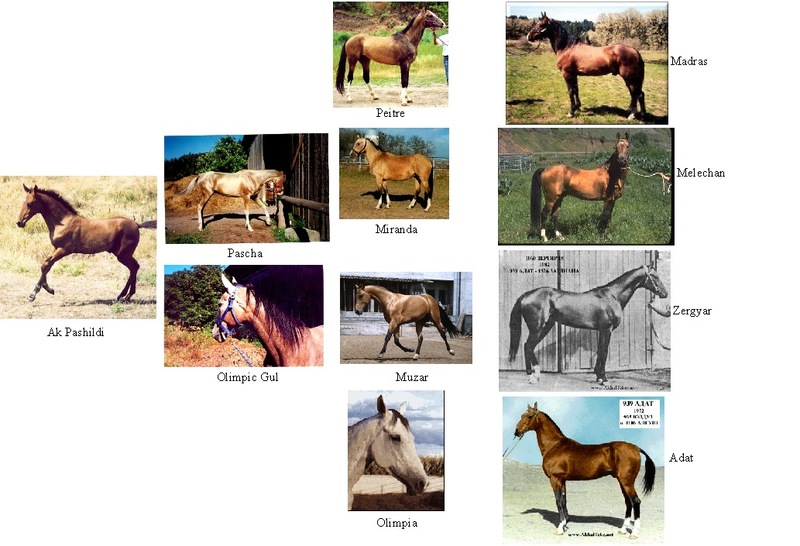 Pascha was sold to California. His sheen was so amazing... people could not believe their eyes when they saw him. 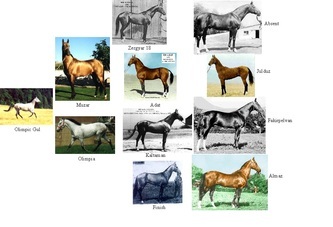 He passed it on to all of his offspring. 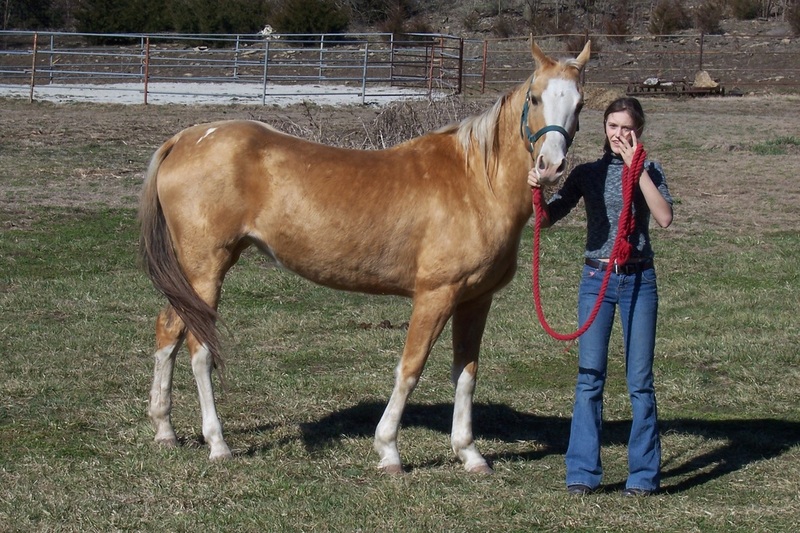 Pascha was an amazingly sweet stallion, easy to handle and liked to cuddle! 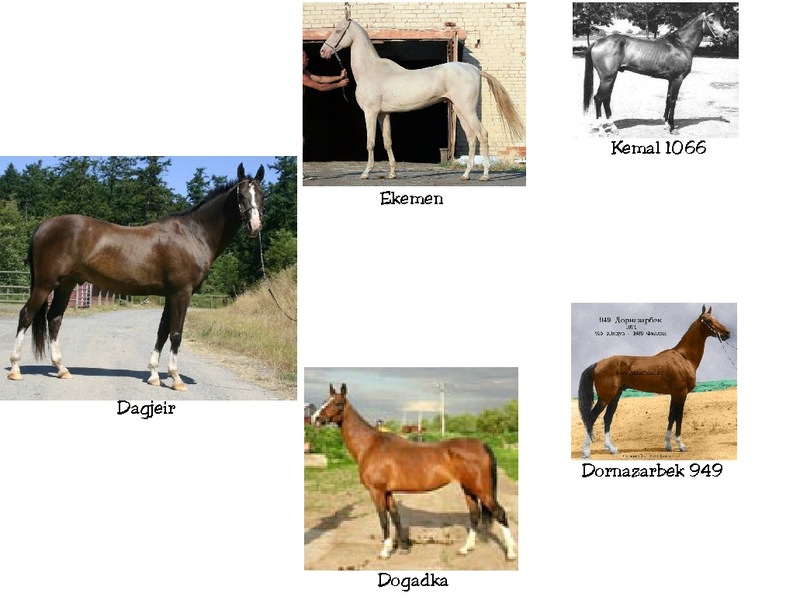 Olimpic Gul, or "Olga" for short, is an outstanding jumper and broodmare. 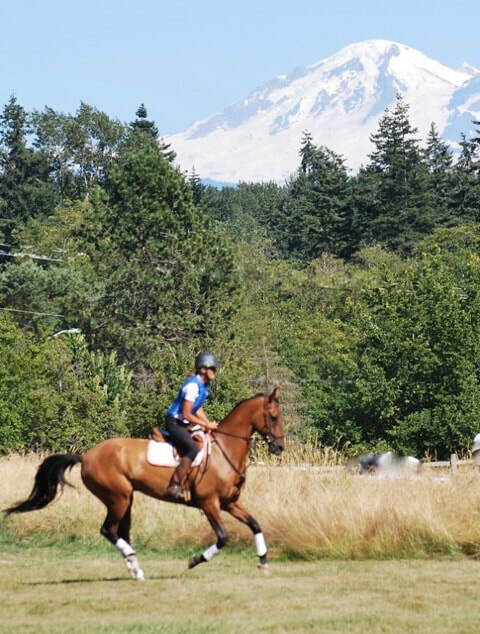 Her daughter Ovazli Gul is a jumper in Canada, and her son Paktaly is currently being competed in 3 day eventing at Sweet Water Farm. 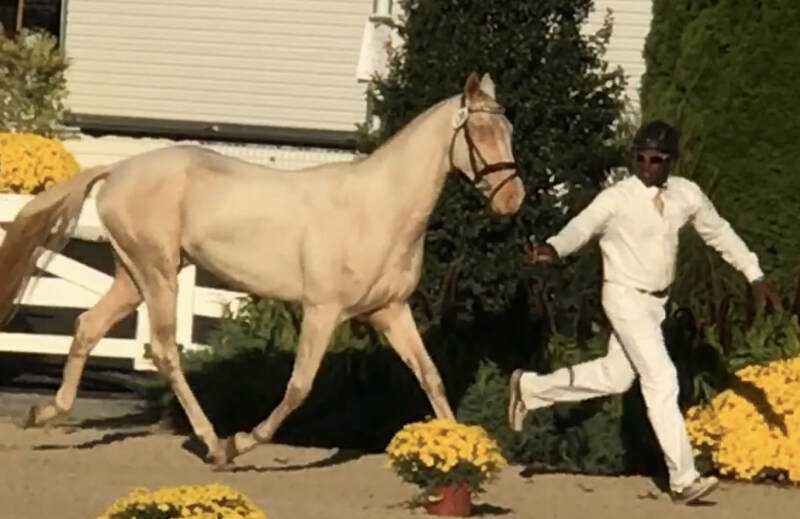 Her son Ak Pashildi, sold to The Bahamas, is a great sport horse as well. 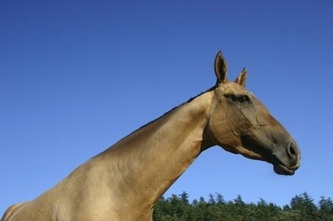 Olga now lives in Canada at Bold Vantage Farm. Shazada was an avid jumper! 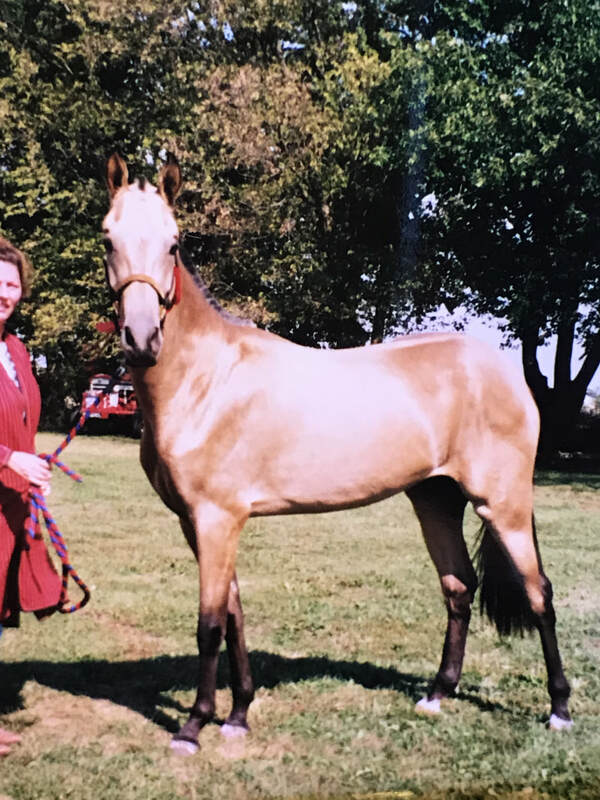 After an eventing career she became a broodmare. Shazada's first foal was breached... she survived, but her colt did not. 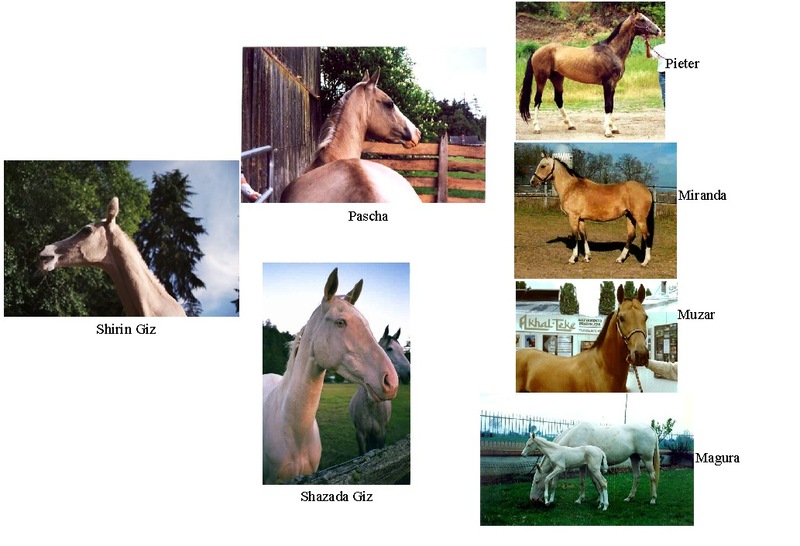 She had two more fillies after that, Shirin Giz, who we sold and now lives in Alabama. And Shara, owned by Cascade Gold Akhal-Tekes. 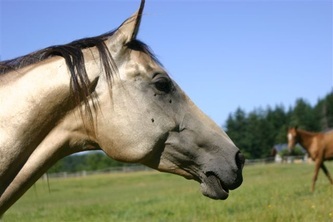 Shazada sadly passed away in 2009. Aktepel, Ak Sakal line mare, imported from Switzerland, born 2000 by Schamborant x Atteschgja. 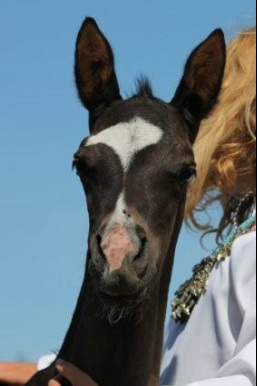 "Aktepel" means snowflake... she has a tiny white dot on her forehead, and was born during a snow storm. 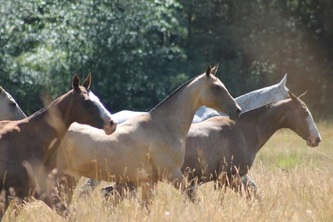 She is an exceptionally kind lead mare... who always allows other horses to be around her. She is never bossy... but always friendly and social. 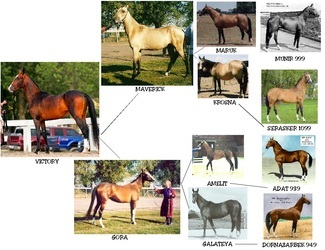 We have two outstanding fillies by her: Ayal Pikira and Altyn Gush, both by Pascha. 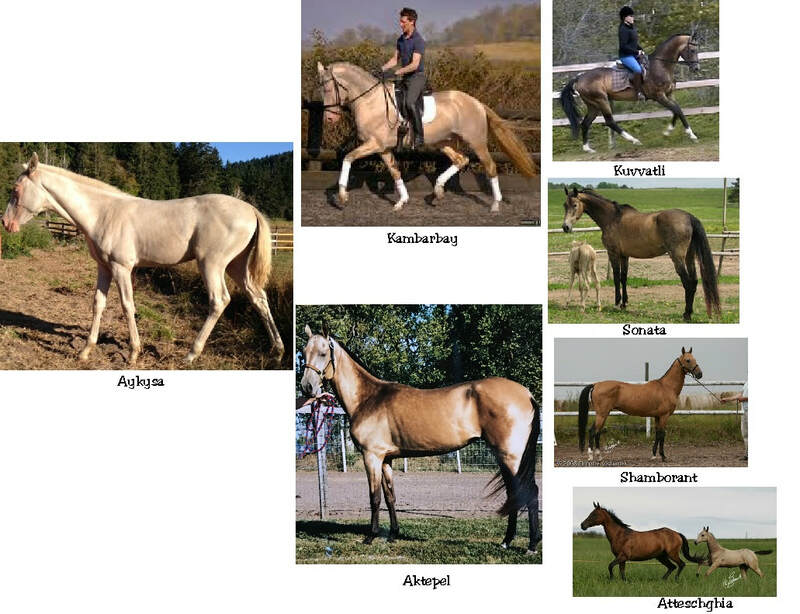 Like Pascha, Aktepel has the rare iridescent sheen, and passed it on to both daughters. 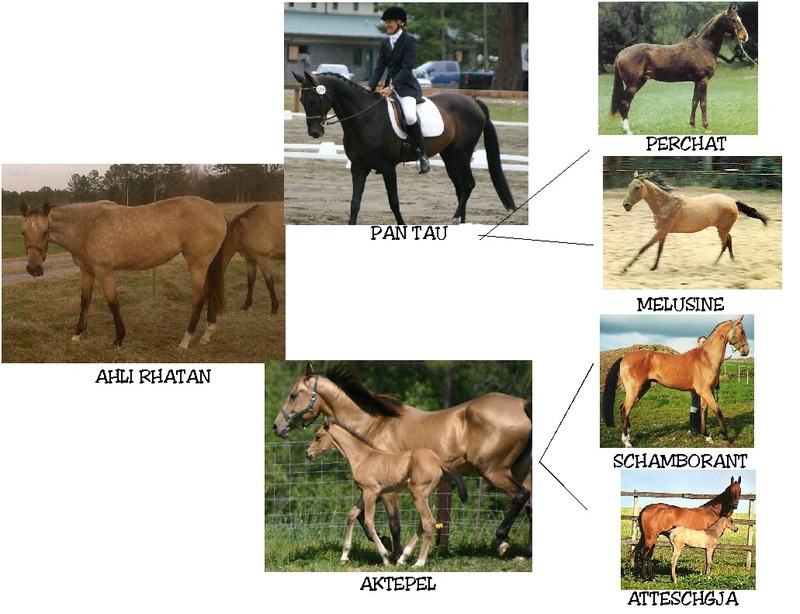 We sold Aktepel to Alabama in foal to Pan Tau, and again she had a filly: Ahli Rhatan. 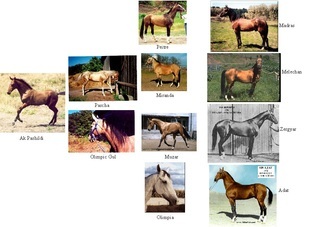 I went to visit them when she was born, and took the picture on the left. Ahli Rhatan was bred by us, and sold before she was born. 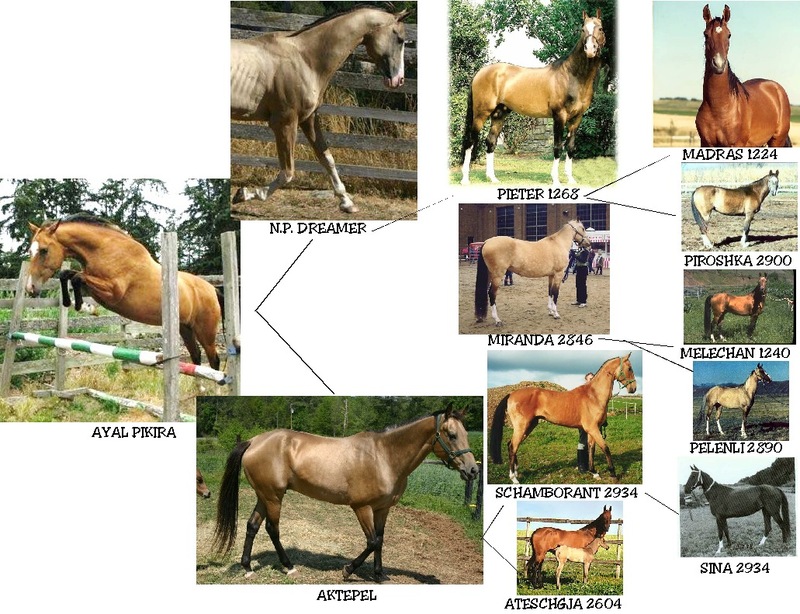 She is one of the few mares sired by Pan Tau. 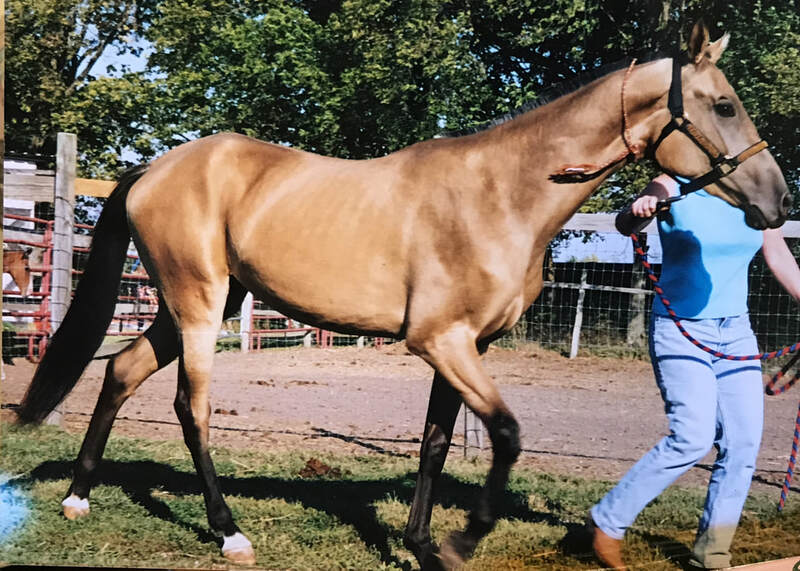 I visited her when she was a few months old, and these pictures are of her as a 2 year old. 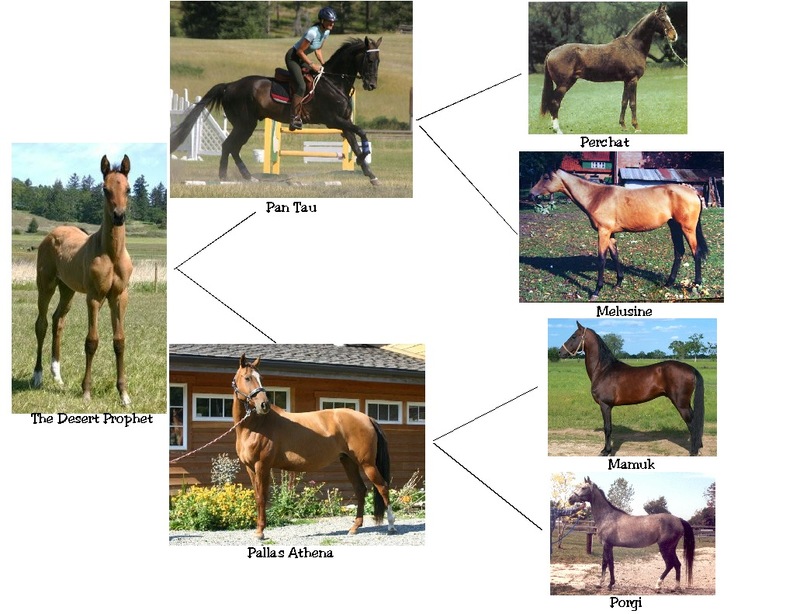 As with most offspring of Pan Tau, she is a tall mare! 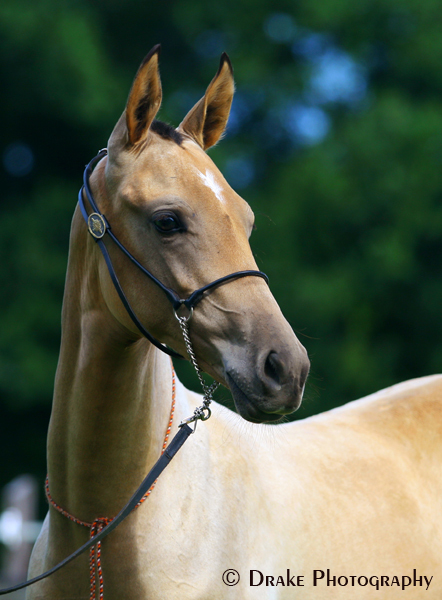 And a buckskin! Kamiah is an extremely sweet-natured mare and devoted mother. 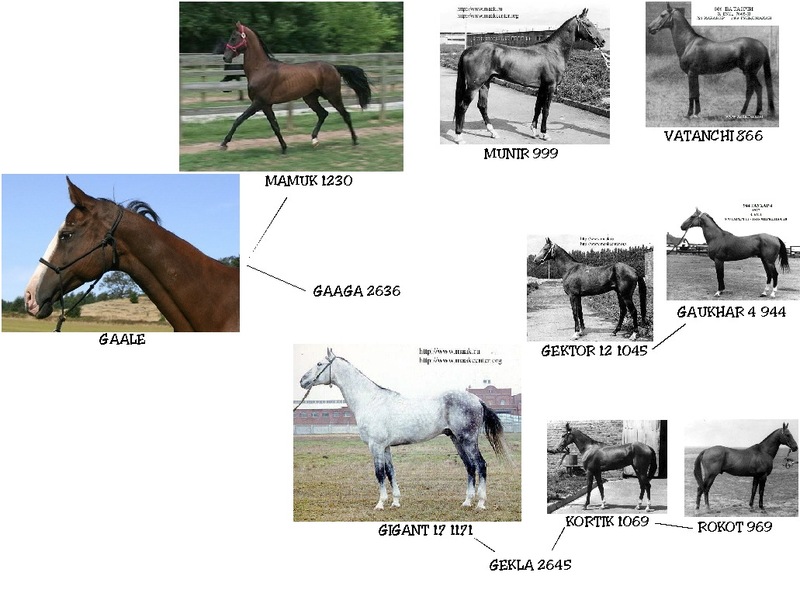 She had one filly while with us, Kitchi Gul ("little flower"). Kitchi now lives in Canada. 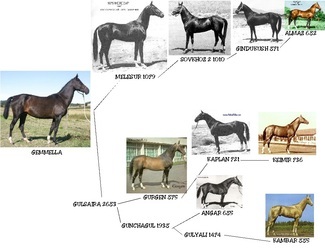 Ovazli Gul means "melodious flower." 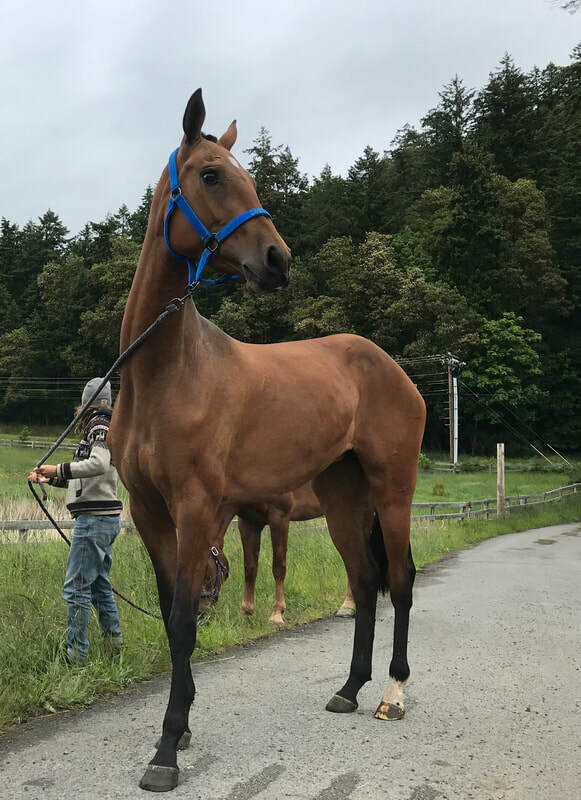 She was sold to Canada. 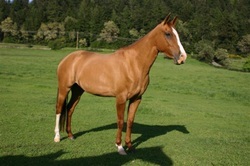 She now lives at Bold Vantage Farm where they are competing her in Jumpers. 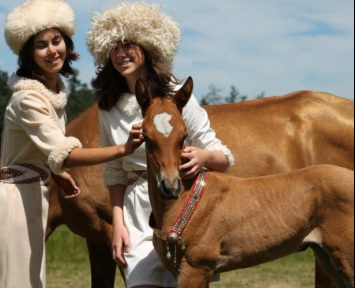 Kitchi Gul means "little flower." 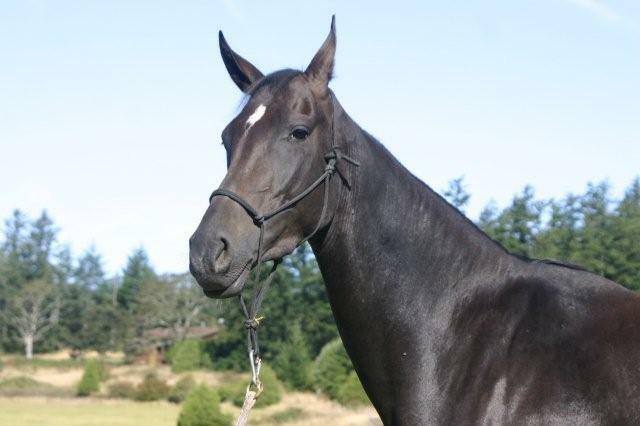 Her nickname at our farm was "Dramatic Eyes", because her eyes are so hooded and exotic-looking. 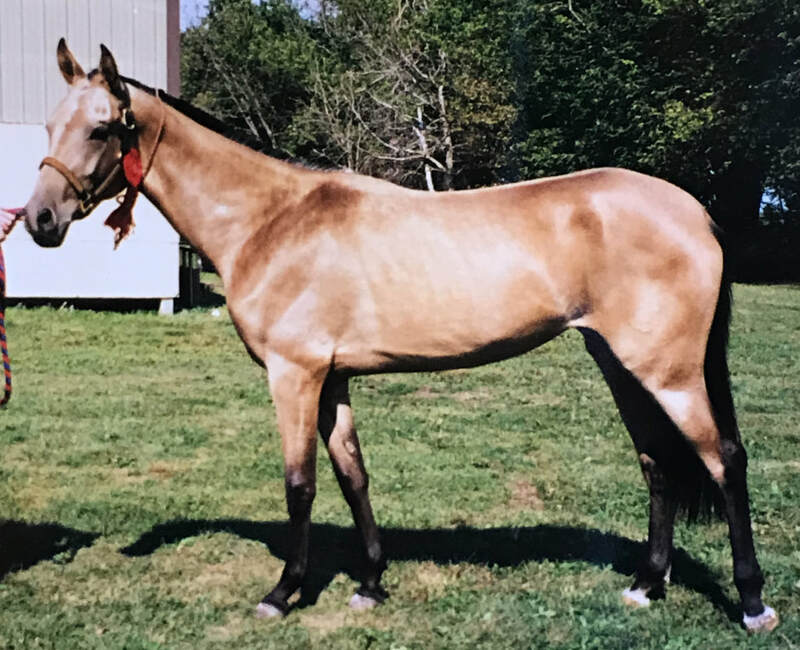 She was sold as a youngster to Canada and resides at Bold Vantage Farm. 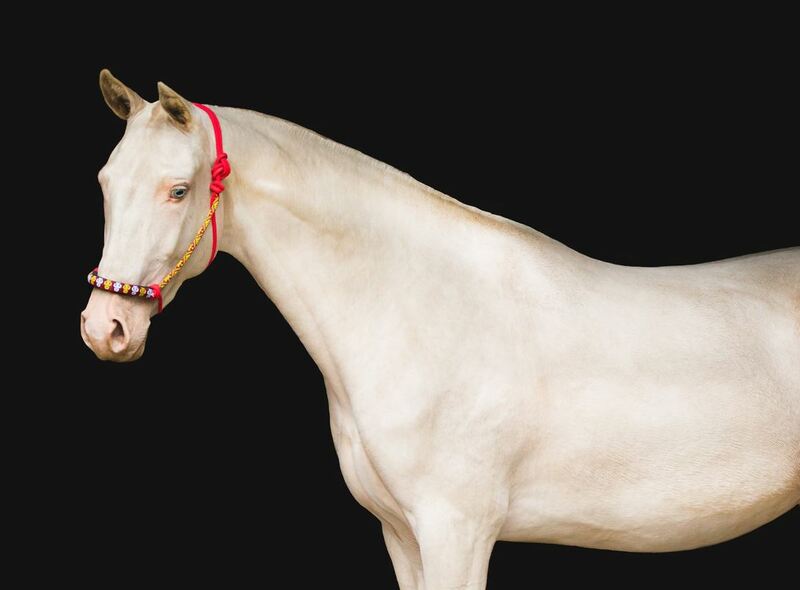 Ak Pashildi means "white splash," which we gave him because he has a little white spot on his forehead. 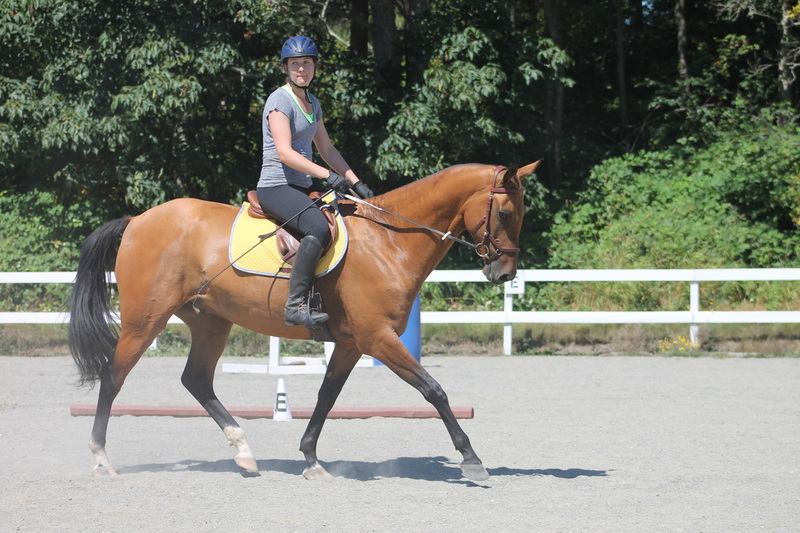 Pashildi is extremely athletic, and amazingly smooth to ride. 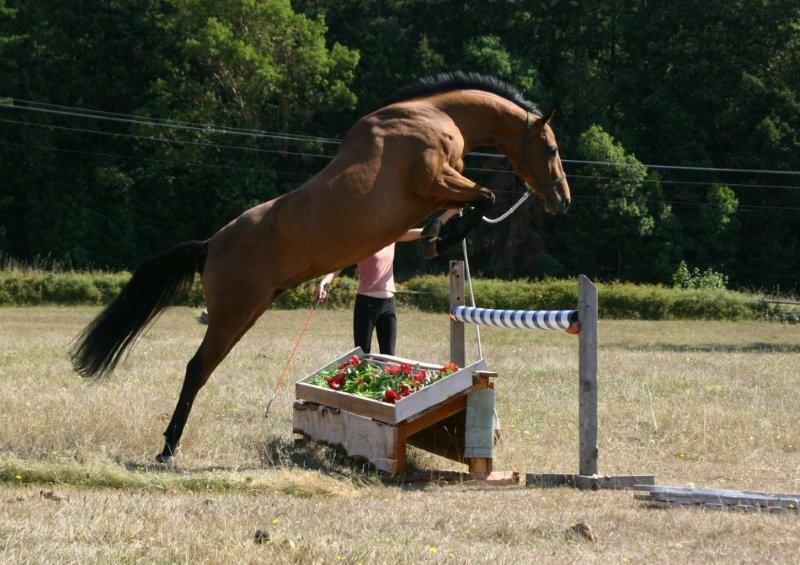 And as you can see in the photo below, he packs a powerful jump! He now enjoys life in The Bahamas. 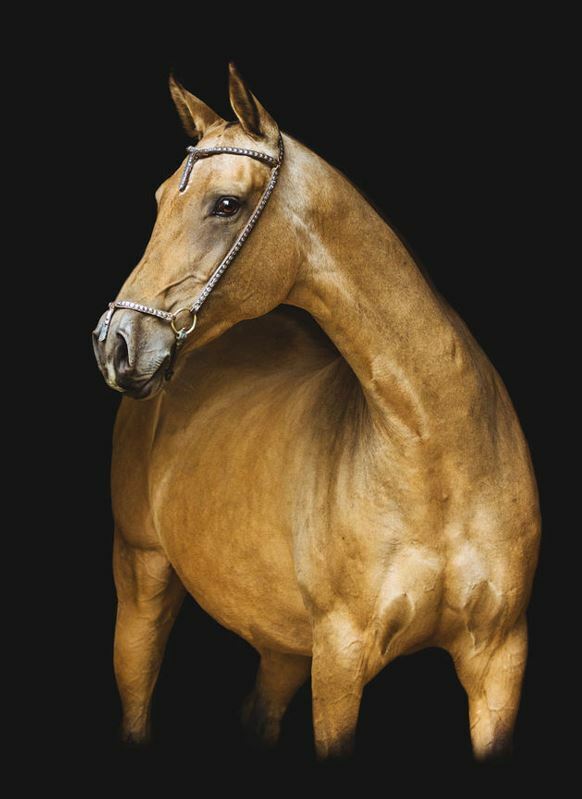 Dagjeir... we call him The Ferrari of Horses... he is truly one of a kind! 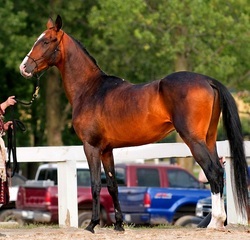 Imported from Russia as a youngster, he was sold to New York in 2010, and is now back in training with us to be sold again. 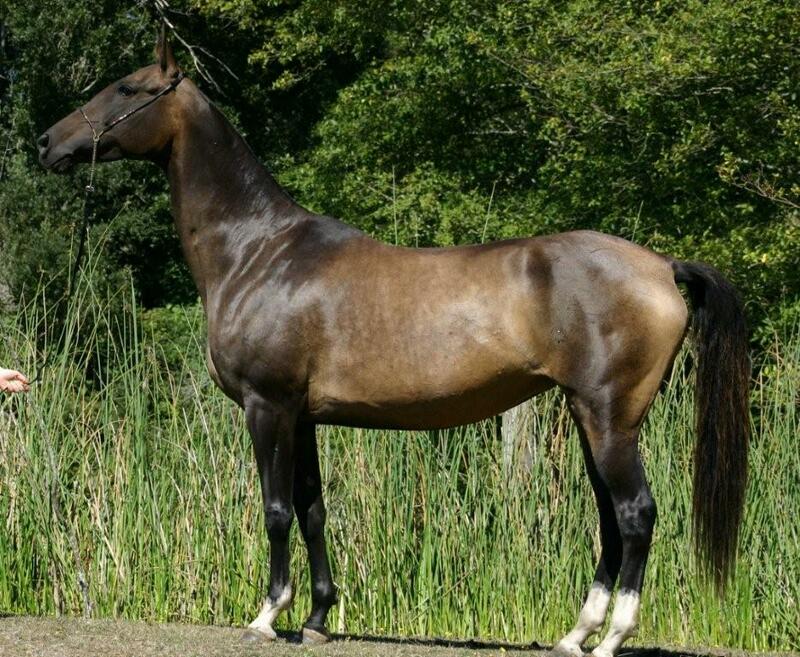 Dagjeir steals the hearts of everyone who is lucky enough to know him. 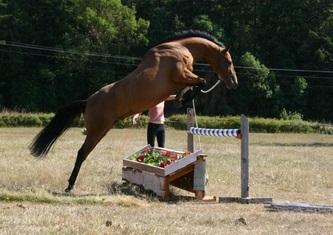 Elegant, athletic, smart... he is brave on cross country, has a SUPER jump, and is very clever with his feet. 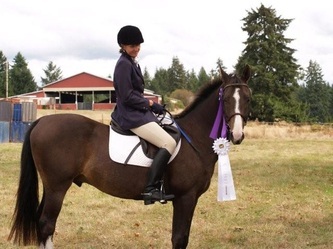 He did his first Training Level USEA three-day event in Fall of 2011, and even though he had not been evented for 2 years, he got 7th place. 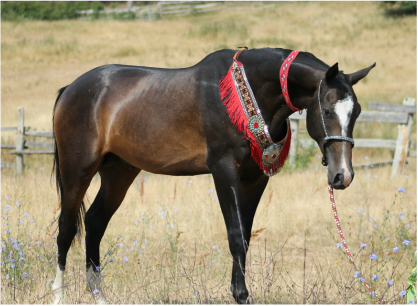 He is always in the ribbons! Shirin Giz means "sweet girl," and that's exactly what she is... very sweet. 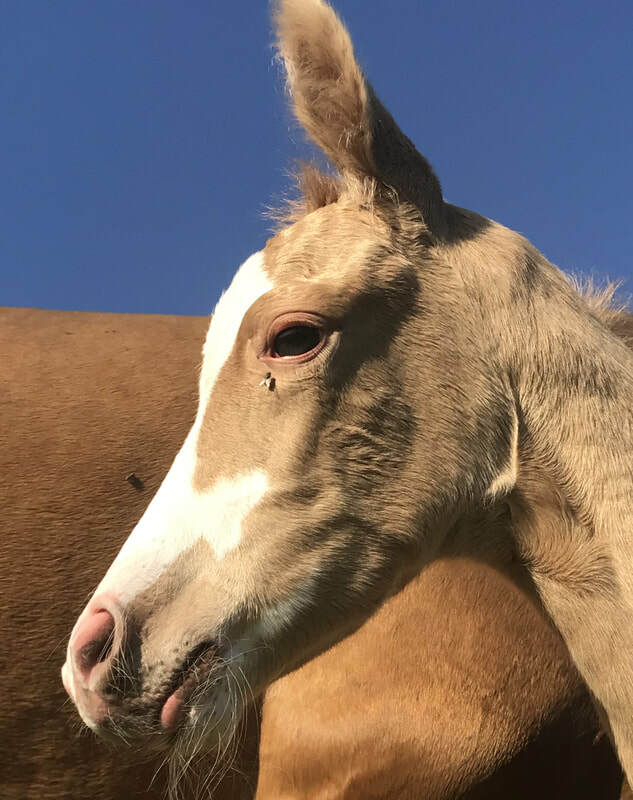 She kept us puzzled during her first year as to what color she would be... she was cremello-looking at birth, and steel-gray in her first winter coat. But turned to golden buckskin later in life. She is currently living in Alabama. Misha is a full sister of the stallion Nez Perce Dreamer (Pascha). 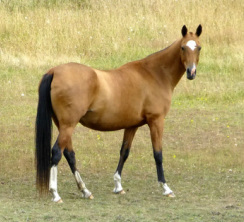 She is an easy-going mare with a lovely personality. She was sold to Kansas where she is used as a riding horse and broodmare. 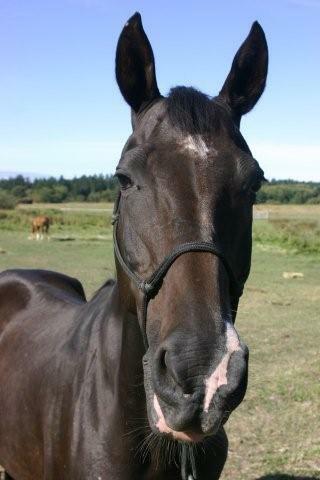 Teddy is a real sweet heart and lives up to his nickname! 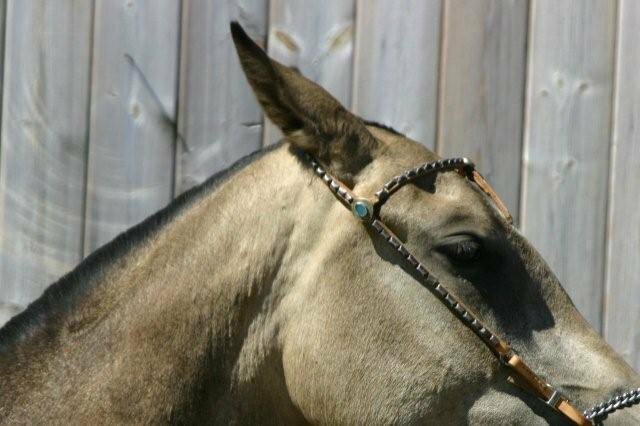 He whinnies when he sees you and put his nose in the halter every time. 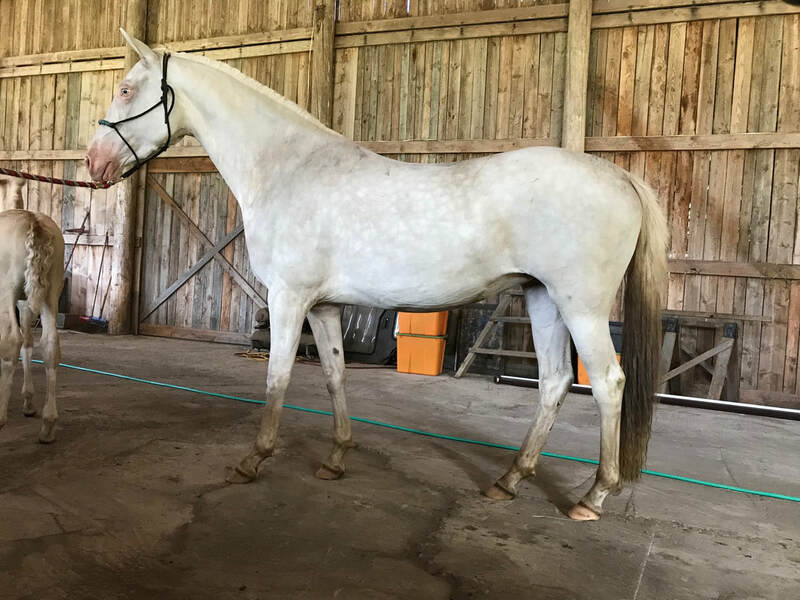 Great work ethic and easy to train... Teddy is one of those truly wonderful horses that are uncomplicated, forward-moving, smooth as silk.. and an all-around joy to ride. Teddy is now living in Ohio. 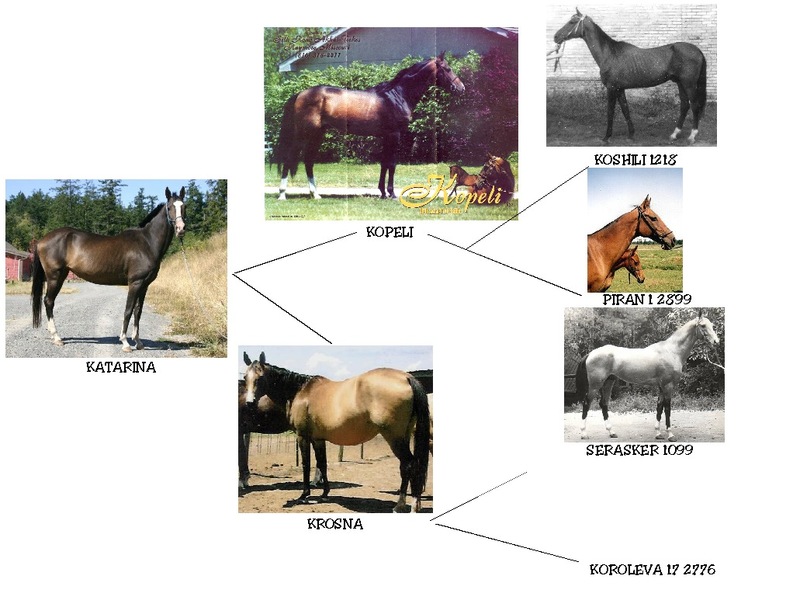 Katarina was at our farm briefly, then sold to Bold Vantage Farm in Canada. 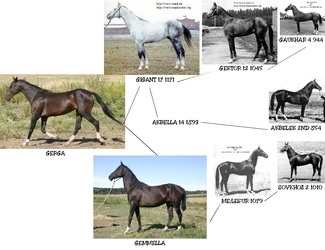 Gemella is an excellent broodmare who came to our farm for sales. She now lives at Bold Vantage Farm in Canada.